Time is scarce and people value both free time and what they can buy with their earnings from the time they spend at work. We can model these situations. First, we can define all the feasible actions that are available to the decision-maker, such as working shorter or longer hours and buying fewer or more goods. Second, we can describe which actions the decision-maker prefers. There are unavoidable trade-offs in the presence of scarcity—satisfying one objective, such as having more free time, means satisfying other objectives less, such as having more possessions. This model helps to explain differences in the hours that people work in different countries, and the changes in our hours of work throughout history. We introduce conspicuous consumption effects to explain both why people work longer hours in countries where the very rich receive a larger fraction of the income and why, as a nation gets richer, its citizens may not become happier. Measures of wellbeing such as GDP per capita focus narrowly on goods and services; we look at other measures. The hockey stick charts in Unit 1 illustrated the dramatic increases in goods and services consumed in countries that have experienced the capitalist revolution. This prompts the question of whether people have used economic progress as a way, not only to consume more goods, but also to enjoy more free time. The answer is both, but in different proportions in different countries. During the year 1600, the average British worker was at work for 266 days, meaning roughly two days off a week. This statistic did not change much until the Industrial Revolution of the eighteenth century, when wages began to rise, and working time rose too—to 318 days in 1870. The number of days off work had been cut by half! If you want to compare working hours in 1870 to those in the modern world, Michael Huberman and Chris Minns calculate them in their paper, ‘The Times They Are Not Changin’: Days and Hours of Work in Old and New Worlds, 1870–2000’. Explorations in Economic History 44 (4): pp. 538–67. What he called ‘the economic problem, the struggle for subsistence’ would be solved, and we would not have to work more than, say, 15 hours per week to satisfy our economic needs. The question he raised was, ‘How would we cope with all the additional leisure time?’. Keynes’ prediction for the rate of technological progress in countries such as the UK and the US has been approximately right, and working hours have indeed fallen, although much less than he expected. It seems extremely unlikely that average working hours will be 15 hours per week by 2030. An article by Tim Harford in the ‘Undercover Economist’ column of the Financial Times examines why Keynes’ prediction was wrong. In the US in the nineteenth century, hours of work initially increased for many workers who shifted from farming to industrial jobs. In 1865, the US abolished slavery, and former slaves used their freedom to work much less. From the late nineteenth century until the middle of the twentieth century, working time gradually fell. 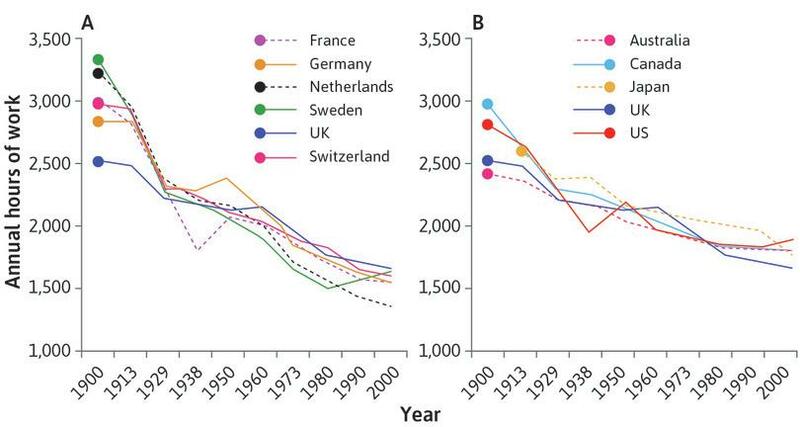 Figure 4.1 shows how annual working hours have fallen since 1900 in many countries. Annual hours of work (1900–2000). Figure 4.1 Annual hours of work (1900–2000). Michael Huberman and Chris Minns. 2007. ‘The Times they are not Changin’: Days and Hours of Work in Old and New Worlds, 1870–2000’. Explorations in Economic History 44 (4): pp. 538–567. Use Figure 4.1 to answer these questions. Looking at both Panel A and B, describe what happened to working hours over the period 1900–2000. Compare working hours in the countries in Panel A with those in Panel B, and describe any differences you see. What possible explanations can you suggest for why the decline in working hours was greater in some countries than in others? Why do you think that the decline in working hours is faster in most countries in the first half of the century compared to the second half? In recent years, is there any country in which working hours have increased? Why do you think this happened? Think how you would respond if your employer offered you a six-fold increase in your wage and the ability to choose your hours of work. At one extreme, you could vastly increase your free time, shrinking your working week to a single day and keeping your consumption unchanged; at the other extreme, you could keep working unchanged hours and enjoy a six-fold increase in earnings. Figure 4.2 shows trends in income and working hours since 1870 in the Netherlands, the US and France. An article gives more historical detail on the hours that people worked in the US: Robert Whaples. 2001. ‘Hours of Work in U.S. History’ EH.net Encyclopedia. As in Unit 1, income is measured as GDP per capita in US dollars. This is not the same as average earnings, but gives us a useful indication of average income for the purposes of comparison across countries and through time. In the late nineteenth and early twentieth centuries, average income approximately tripled, and hours of work fell substantially. During the rest of the twentieth century, income per head rose four-fold. Hours of work continued to fall in the Netherlands and France (albeit more slowly) but levelled off in the US, where there has been little change since 1960. At the end of this unit, we return to these cross-country differences. Annual hours of work and income (1870–2000). Figure 4.2 Annual hours of work and income (1870–2000). Maddison Project. 2013. 2013 Edition. Michael Huberman and Chris Minns. 2007. ‘The Times they are not Changin’: Days and Hours of Work in Old and New Worlds, 1870–2000’. Explorations in Economic History 44 (4): pp. 538–567. GDP is measured at PPP in 1990 international Geary–Khamis dollars. While many countries have experienced similar trends, there are still differences in outcomes. Figure 4.3 illustrates the wide disparities in free time and income between countries in 2013. Here, we have calculated free time by subtracting average annual working hours from the number of hours in a year. You can see that the higher-income countries seem to have lower working hours and more free time, but there are also some striking differences between them. For example, the Netherlands and the US have similar levels of income, but Dutch workers have much more free time. 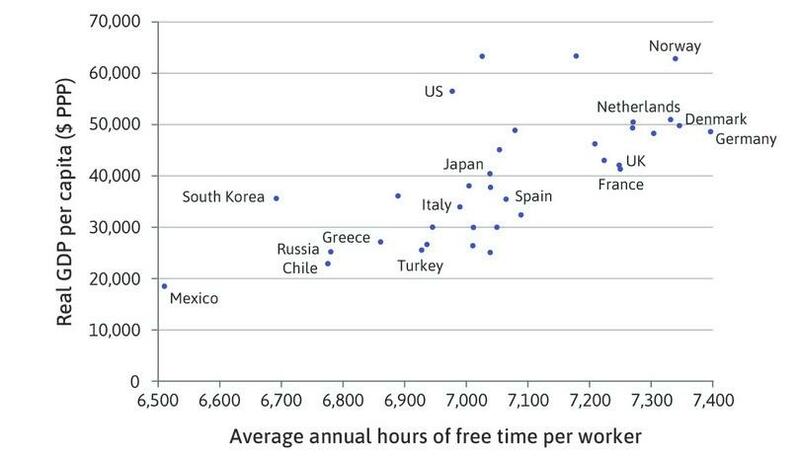 And the US and Turkey have similar amounts of free time, but a large difference in income. Annual hours of free time per worker and income (2013). 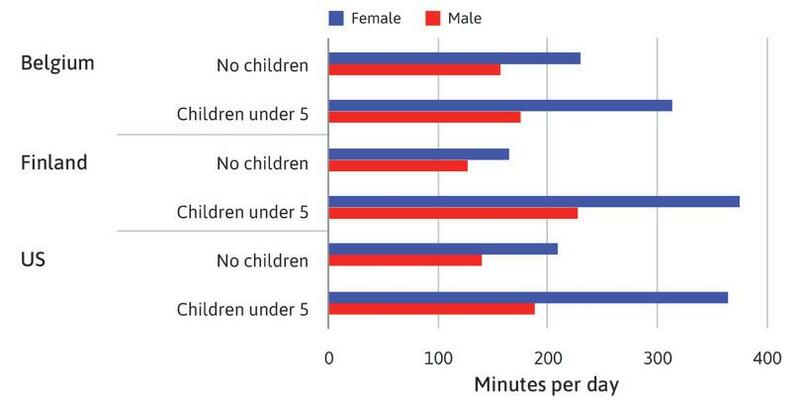 Figure 4.3 Annual hours of free time per worker and income (2013). OECD. Average annual hours actually worked per worker. OECD. Level of GDP per capita and productivity. Accessed June 2016. Data for South Korea refers to 2012. In many countries, there has been a huge increase in living standards since 1870. But in some places, people have carried on working just as many hours as before but consumed more, while in other countries, people now have much more free time. Why has this happened? We will provide some answers to this question by studying a basic problem of economics—scarcity—and how we make choices when we cannot have everything that we want, such as goods and free time. Study our model of decision making carefully! It will be used repeatedly throughout the course, because it gives us an insight into a wide range of economic problems. Based on Figure 4.2, which of the following statements are true? An increase in GDP per capita causes a reduction in the number of hours worked. 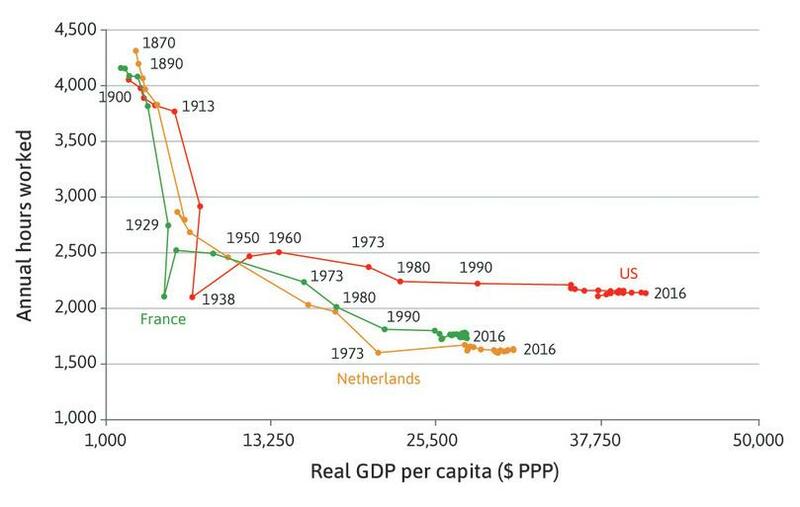 The GDP per capita in the Netherlands is lower than that in the US because the Dutch work fewer hours. Between 1870 and 2000, the French have managed to increase their GDP per capita more than ten-fold, while more than halving the number of hours worked. On the basis of the evidence in the graph, the French will one day be able to produce a GDP per capita of over $30,000 with less than 1,000 hours of work. The negative relationship between the number of hours worked and GDP per capita does not necessarily imply that one causes the other. The lower GDP per capita in the Netherlands may be due to a number of factors, including the possibility that the Dutch may prefer less income but more leisure time for cultural or other reasons. From the start to the end of the line shown, the GDP per capita of France increased from roughly $2,000 to $20,000 (ten-fold) while annual hours worked fell from over 3,000 to under 1,500. That would be nice. However, past performance does not necessarily mean that the trend will continue in the future. Based on Figure 4.3, which of the following statements are true? The plot gives strong evidence that workers choose to enjoy more free time as their living standards rise. Workers in the US and Turkey enjoy a similar amount of free time despite the huge disparity of income. If German workers worked as many hours as the Norwegians, they will be able to produce a similar level of output per capita. Japanese workers require more hours of work to produce the same level of output per capita as Korean workers. While there is positive correlation between GDP per capita and free time, the dispersion suggests that, for some nationalities, the increase in living standard takes the form of more goods and services to consume (for example, the US), while for others this has taken the form of more leisure time (for example, France). As shown in the diagram, workers from the US and Turkey both enjoy 6,900–7,000 hours of free time, but the US has a much higher GDP per capita than Turkey. The Norwegians produce higher output per capita than the Germans, despite both working a similar number of hours. This is the other way around; Japanese workers have more free time than do Korean workers, but produce similar output per capita. We see more by looking at less: A concept called ceteris paribus and other simplifications help us focus on the variables of interest. Incentives matter: Incentives affect the benefits and costs of taking one action as opposed to another. We use relative prices: Using relative prices helps us compare alternatives. Part of the process of learning to do economics involves learning a new language. The terms listed above will recur frequently in the units that follow, and it is important to learn how to use them precisely and with confidence. As is common in scientific inquiry, economists often simplify an analysis by setting aside things that are thought to be of less importance to the question of interest, by using the phrase ‘holding other things constant’ or, more often, the Latin expression ceteris paribus, meaning ‘other things equal’. For example, later in the course we simplify an analysis of what people would choose to buy by looking at the effect of changing a price—ignoring other influences on our behaviour like brand loyalty, or what others would think of our choices. We ask, ‘What would happen if the price changed, but everything else that might influence the decision was the same?’. These ceteris paribus assumptions, when used well, can clarify the picture without distorting the key facts. In scientific experiments and in the experiments conducted by economists that we have considered in previous units, the experimental design holds many things constant in order to uncover the effect of X on Y. The ceteris paribus assumption refers to holding things constant in thought experiments. Why did the water in Fisher’s hydraulic economy machine in Figure 3.17 (Unit 3) move when he changed the quantity of ‘supply’ or ‘demand’ for one or more of the goods, so that the prices were no longer in equilibrium? Gravity acts on the water so it finds the lowest level. Channels allow the water to seek out the lowest level, but restrict the ways in which it can flow. All economic models have something equivalent to gravity, and a description of the kinds of movements that are possible. The equivalent of gravity is the assumption that, by taking one course of action over another, people are attempting to do as well as they can (according to some standard). The analogy to the free movement of water in Fisher’s machine is that people are free to select different courses of action, rather than simply being told what to do. This is where economic incentives affect the choices we make. But not every channel is open to us: we can’t do everything we want to do. Like many economic models, the one we use to explain the trade-off between free time and work is based on the idea that people respond to economic incentives. As we have seen in Units 2 and 3, people are motivated not only by the desire for material gain but also by love, hate, sense of duty, and desire for approval. But material comfort is an important motive, and economic incentives appeal to this motive. When owners or managers of firms decide how many workers to hire, or when shoppers decide what and how much to buy, prices are going to be an important factor determining their decision. If prices are a lot lower in the discount supermarket than in the corner shop, and it is not too far away, then this will be a good argument for buying our food in the supermarket rather than the corner shop. A third characteristic of many economic models is that we are often interested in ratios of things, rather than their absolute level. Economics focuses attention on alternatives and choices. If you are deciding where to shop, it is not the corner shop prices alone that matter, but rather the prices relative to those in the supermarket and relative to the costs of reaching the supermarket. If all of these were to rise by 5%, your decision probably wouldn’t change. Relative prices are simply the price of one option relative to another. We often express relative price as the ratio of two prices. We will see that they matter a lot in explaining not just what shoppers (or consumers, as we usually call them) decide to buy, but why firms make the choices that they do. As a student, you choose how many hours to spend studying every day. There may be many factors influencing your choice—how much you enjoy studying, how difficult you find it, how much studying your friends do, and so on. Perhaps part of the motivation to devote time to studying comes from your belief that, the more time you spend studying, the higher the grade you will obtain at the end of the course. In this unit, we will construct a simple model of a student’s choice of how many hours to work, based on the assumption that the more time spent working, the better the final grade will be. At first sight, there seems to be only a weak relationship between the average number of hours per week the students spent studying and their Grade Point Average (GPA) at the end of the semester. This is in Figure 4.4. The 84 students have been split into two groups of 42 students each, according to their hours of study. The average GPA for those with high study time is 3.43—only slightly more than the GPA of those with low study time. Figure 4.4 Study time and grades. Plant et al. 2005. ‘Why study time does not predict grade point average across college students.’ pp. 96–116. Additional calculations were conducted by Ashby Plant, Florida State University, in June 2015. Looking more closely, we discover this study is an interesting illustration of why we should be careful when we make ceteris paribus assumptions. Within each group of 42 students, there are many potentially important differences. The conditions in which they study would be an obvious difference to consider—an hour working in a busy, noisy room may not be as useful as an hour spent in the library. 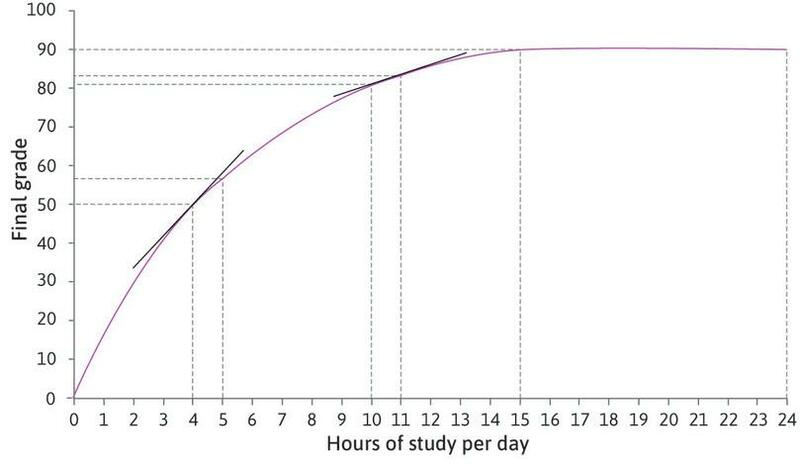 In Figure 4.5, we see that students studying in poor environments are more likely to study longer hours. Of these 42 students, 31 of them have high study time, compared with only 11 of the students with good environments. Perhaps they are distracted by other people around them, so it takes them longer to complete their assignments than those students who work in the library. Average GPA in good and poor study environments. Figure 4.5 Average GPA in good and poor study environments. Plant et al. ‘Why study time does not predict grade point average across college students’, ibid. Now look at the average GPAs in the top row—if the environment is good, students who study longer do better. You can see in the bottom row that high study time pays off for those who work in poor environments too. This relationship was not as clear when we didn’t consider the effect of the study environment. After considering environment and other relevant factors (including the students’ past GPAs and the hours they spent in paid work or partying), the psychologists estimated that an additional hour of study time per week raised a student’s GPA at the end of the semester by 0.24 points on average. If we take two students who are the same in all respects except for study time, we predict that the one who studies for longer will have a GPA that is 0.24 points higher for each extra hour—in other words, study time raises GPA by 0.24 per hour, ceteris paribus. You have been asked to conduct a research study at your university, similar to the one done at Florida State University. What factors do you think should be held constant in a model of the relationship between study hours and final grade? What other information about the students, in addition to study environment, would you want to collect? Based on Figure 4.5, which of the following statements are true? More students choose to spend a longer time studying in a bad environment than in a good environment. High study time is associated with a better grade. All students who spend a longer time studying attain a higher grade on average than those who study fewer hours. The amount of time spent studying is important, while the environment has no effect on the results. It may be that students need more time to complete assignments in a bad environment. Whatever the reason, this is true from the table. This is true for students in both good and bad study environments. This is not true; those who spend longer studying in a bad environment attain lower grades on average than those who spend less time studying in a good environment. In both cases of high study time and low study time, the grades are higher in a good environment than in a bad environment. Now imagine Alexei is a student who can vary the number of hours he spends studying. We will assume that, as in the Florida State University study, the hours he spends studying over the semester will increase the percentage grade that he will receive at the end, ceteris paribus. This relationship between study time and final grade is represented in the table in Figure 4.6. In this model, study time refers to all the time that Alexei spends learning, whether in class or individually, measured per day (not per week, as for the Florida students). The table shows how his grade will vary if he changes his study hours, if all other factors—his social life, for example—are held constant. This is Alexei’s production function. In general, a production function tells us how much of a good or service is produced, given the inputs into the production process. In Alexei’s case, it translates the number of hours per day spent studying (his input of labour) into a percentage grade (his output). In reality, the final grade might also be affected by unpredictable events (in everyday life, we normally lump the effect of these things together and call it ‘luck’). You can think of the production function as telling us what Alexei will get under normal conditions, if he is neither lucky nor unlucky. If we plot this relationship on a graph, we get the curve in Figure 4.6. Alexei can achieve a higher grade by studying more, so the curve slopes upward. At 15 hours of work per day he gets the highest grade he is capable of, which is 90%. Any further time spent studying does not affect his exam result (he will be so tired that studying more each day will not achieve anything), and the curve becomes flat. Alexei’s marginal product is the increase in his grade from increasing study time by one hour. Follow the steps in Figure 4.6 to see how to calculate the marginal product. How does the amount of time spent studying affect Alexei’s grade? Figure 4.6 How does the amount of time spent studying affect Alexei’s grade? The curve is Alexei’s production function. It shows how an input of study hours produces an output, the exam grade. Figure 4.6a The curve is Alexei’s production function. It shows how an input of study hours produces an output, the exam grade. If Alexei studies for 4 hours, his grade will be 50. Figure 4.6b If Alexei studies for 4 hours, his grade will be 50. If he studies for 10 hours, he will achieve a grade of 81. Figure 4.6c If he studies for 10 hours, he will achieve a grade of 81. At 15 hours of study per day, Alexei achieves his maximum possible grade, 90. After that, further hours will make no difference to his result—the curve is flat. Figure 4.6d At 15 hours of study per day, Alexei achieves his maximum possible grade, 90. After that, further hours will make no difference to his result—the curve is flat. Increasing study time from 4 to 5 hours raises Alexei’s grade from 50 to 57. Therefore, at 4 hours of study, the marginal product of an additional hour is 7. Figure 4.6e Increasing study time from 4 to 5 hours raises Alexei’s grade from 50 to 57. Therefore, at 4 hours of study, the marginal product of an additional hour is 7. Increasing study time from 10 to 11 hours raises Alexei’s grade from 81 to 84. At 10 hours of study, the marginal product of an additional hour is 3. As we move along the curve, the slope of the curve falls, so the marginal product of an extra hour falls. The marginal product is diminishing. Figure 4.6f Increasing study time from 10 to 11 hours raises Alexei’s grade from 81 to 84. At 10 hours of study, the marginal product of an additional hour is 3. As we move along the curve, the slope of the curve falls, so the marginal product of an extra hour falls. The marginal product is diminishing. The marginal product is the slope of the line that just touches but does not cross the production function. The marginal product at four hours of study is approximately 7, which is the increase in the grade from one more hour of study. More precisely, the marginal product is the slope of the line at that point, which is slightly higher than 7. Figure 4.6g The marginal product is the slope of the line that just touches but does not cross the production function. The marginal product at four hours of study is approximately 7, which is the increase in the grade from one more hour of study. More precisely, the marginal product is the slope of the line at that point, which is slightly higher than 7. At each point on the production function, the marginal product is the increase in the grade from studying one more hour. The marginal product corresponds to the slope of the production function. Alexei’s production function in Figure 4.6 gets flatter the more hours he studies, so the marginal product of an additional hour falls as we move along the curve. The marginal product is diminishing. The model captures the idea that an extra hour of study helps a lot if you are not studying much, but if you are already studying a lot, then studying even more does not help very much. Notice that, if Alexei was already studying for 15 hours a day, the marginal product of an additional hour would be zero. Studying more would not improve his grade. As you might know from experience, a lack of either sleep or time to relax could even lower Alexei’s grade if he worked more than 15 hours a day. If this were the case, then his production function would start to slope downward, and Alexei’s marginal product would become negative. Marginal change is an important and common concept in economics. You will often see it marked as a slope on a diagram. With a production function like the one in Figure 4.6, the slope changes continuously as we move along the curve. We have said that when Alexei studies for 4 hours a day the marginal product is 7, the increase in the grade from one more hour of study. Because the slope of the curve changes between 4 and 5 hours on the horizontal axis, this is only an approximation of the actual marginal product. More precisely, the marginal product is the rate at which the grade increases, per hour of additional study. In Figure 4.6, the true marginal product is the slope of the line that just touches the curve at 4 hours. In this unit, we will use approximations so that we can work in whole numbers, but you may notice that sometimes these numbers are not quite the same as the slopes. Based on Figure 4.6, which of the following statements are true? The marginal product at 4 hours of study is 7. The marginal product decreases beyond 15 hours of study. The horizontal production function beyond 15 hours means that studying for more than 15 hours is detrimental to Alexei’s performance. The marginal product at 7 hours of study is higher than at 10 hours of study. Increasing study hours from 4 to 5 changes the final grade from 50 to 57, so the marginal product at 4 hours of study is 7. The curve is flat after 15 hours of study, meaning that an extra hour of study has no effect on the final grade. The marginal product is therefore constant (zero). The curve is flat after 15 hours of study, meaning that studying more than 15 hours has no effect on the final grade. The marginal product at 7 hours is 4 (73 – 69), while the marginal product at 10 hours is 3 (84 – 81). If Alexei has the production function shown in Figure 4.6, how many hours per day will he choose to study? The decision depends on his preferences. The term preferences describes the benefit or cost that we associate with each possible outcome. In this case, his preferences describe the benefits (a higher grade) and the cost (less free time) associated with studying any particular number of hours. If he cared only about grades, he should study for 15 hours a day. But, like other people, Alexei also values his free time—he likes to sleep, go out or watch TV. So he faces a trade-off—how many percentage points is he willing to give up in order to spend time on things other than study? We illustrate his preferences using Figure 4.7, with free time on the horizontal axis and final grade on the vertical axis. Free time is defined as all the time that he does not spend studying. Every point in the diagram represents a different combination of free time and final grade. Given his production function, not every combination that Alexei would want will be possible, but for the moment we will only consider the combinations that he would prefer. For a given grade, he prefers a combination with more free time to one with less free time. Therefore, even though both A and B in Figure 4.6 correspond to a grade of 84, Alexei prefers A because it gives him more free time. Similarly, if two combinations both have 20 hours of free time, he prefers the one with a higher grade. But compare points A and D in the table. Would Alexei prefer D (low grade, plenty of time) or A (higher grade, less time)? One way to find out would be to ask him. Suppose he says he is indifferent between A and D, meaning he would feel equally satisfied with either outcome. We say that these two outcomes would give Alexei the same utility. And we know that he prefers A to B, so B provides lower utility than A or D.
A systematic way to graph Alexei’s preferences would be to start by looking for all the combinations that give him the same utility as A and D. We could ask Alexei another question, ‘Imagine that you could have the combination at A (15 hours of free time, 84 points). How many points would you be willing to sacrifice for an extra hour of free time?’. Suppose that, after due consideration, he answers ‘9’. Then we know that he is indifferent between A and E (16 hours, 75 points). Then we could ask the same question about combination E, and so on until point D. Eventually, we could draw up a table like the one in Figure 4.7. Alexei is indifferent between A and E, between E and F, and so on, which means he is indifferent between all the combinations from A to D.
The combinations in the table are plotted in Figure 4.7 and joined together to form a downward-sloping curve, called an indifference curve, which joins together all the combinations that provide equal utility or ‘satisfaction’. Figure 4.7 Mapping Alexei’s preferences. Combinations A and B both deliver a grade of 84, but Alexei will prefer A because it has more free time. Figure 4.7a Combinations A and B both deliver a grade of 84, but Alexei will prefer A because it has more free time. At combinations C and D, Alexei has 20 hours of free time per day, but he prefers D because it gives him a higher grade. Figure 4.7b At combinations C and D, Alexei has 20 hours of free time per day, but he prefers D because it gives him a higher grade. We don’t know whether Alexei prefers A or E, so we ask him—he says he is indifferent. Figure 4.7c We don’t know whether Alexei prefers A or E, so we ask him—he says he is indifferent. Alexei says that F is another combination that would give him the same utility as A and E.
Figure 4.7d Alexei says that F is another combination that would give him the same utility as A and E.
By asking more questions, we discover that Alexei is indifferent between all the combinations between A and D.
Figure 4.7e By asking more questions, we discover that Alexei is indifferent between all the combinations between A and D.
These points are joined together to form an indifference curve. Figure 4.7f These points are joined together to form an indifference curve. Indifference curves can be drawn through any point in the diagram, to show other points giving the same utility. We can construct other curves, starting from B or C in the same way as before, by finding out which combinations give the same amount of utility. Figure 4.7g Indifference curves can be drawn through any point in the diagram, to show other points giving the same utility. We can construct other curves, starting from B or C in the same way as before, by finding out which combinations give the same amount of utility. If you look at the three curves drawn in Figure 4.7, you can see that the one through A gives higher utility than the one through B. The curve through C gives the lowest utility of the three. To describe preferences, we don’t need to know the exact utility of each option; we only need to know which combinations provide more or less utility than others. Indifference curves slope downward due to trade-offs: Since resources (such as time or money) are limited, to get more of one good usually means giving up some of the other good(s). Therefore, if you are indifferent between two combinations, the combination that has more of one good must have less of the other good. Higher indifference curves correspond to higher utility levels: As we move up and to the right in the diagram, further away from the origin, we move to combinations with more of both goods. Indifference curves are usually smooth: Small changes in the amounts of goods don’t cause big jumps in utility. Indifference curves do not cross: Work through Exercise 4.3 below to understand why. As you move to the right along an indifference curve, it becomes flatter. Based on Figure 4.7, which of the following statements is correct? A is the student’s most preferred choice as she would be attaining the highest grade. At A, the student is willing to give up 34 grade points for 5 extra hours of free time. If at B the number of free hours is 10, then the student is 50% happier at A than at B. The student strictly prefers a grade of 54 with 19 hours of free time to a grade of 67 with 18 hours of free time. The student is indifferent between A and all the other points on the same indifference curve, namely E, F, G, H and D.
This is true, as points A and D are on the same indifference curve. Higher indifference curves imply higher levels of utility, but the specific level of utility depends on the student’s relative preferences for both goods. It is not necessarily true that 50% additional free time would make the student 50% happier. A grade of 54 with 19 hours of free time is point H. The student is indifferent between this point and point F, where she gets a grade of 67 with 17 hours of free time. She would, therefore, strictly prefer a grade of 67 with 18 hours of free time to H.
Look at Alexei’s indifference curves, which are plotted again in Figure 4.8. If he is at A, with 15 hours of free time and a grade of 84, he would be willing to sacrifice 9 percentage points for an extra hour of free time, taking him to E (remember that he is indifferent between A and E). We say that his marginal rate of substitution (MRS) between grade points and free time at A is nine; it is the reduction in his grade that would keep Alexei’s utility constant following a one-hour increase of free time. We have drawn the indifference curves as becoming gradually flatter because it seems reasonable to assume that, the more free time and the lower the grade he has, the less willing he will be to sacrifice further percentage points in return for free time, so his MRS will be lower. In Figure 4.8, we have calculated the MRS for some combinations along the indifference curve. You can see that, when Alexei has more free time and a lower grade, the MRS—the number of percentage points he would give up to gain an extra hour of free time—gradually falls. The marginal rate of substitution. Figure 4.8 The marginal rate of substitution. The diagram shows three indifference curves for Alexei. The curve furthest to the left offers the lowest satisfaction. Figure 4.8a The diagram shows three indifference curves for Alexei. The curve furthest to the left offers the lowest satisfaction. At A, he has 15 hours of free time and his grade is 84. Figure 4.8b At A, he has 15 hours of free time and his grade is 84. He would be willing to move from A to E, giving up 9 percentage points for an extra hour of free time. His marginal rate of substitution is 9. The indifference curve is steep at A. Figure 4.8c He would be willing to move from A to E, giving up 9 percentage points for an extra hour of free time. His marginal rate of substitution is 9. The indifference curve is steep at A. At H he is only willing to give up 4 points for an extra hour of free time. His MRS is 4. As we move down the indifference curve, the MRS diminishes, because points become scarce relative to free time. The indifference curve becomes flatter. 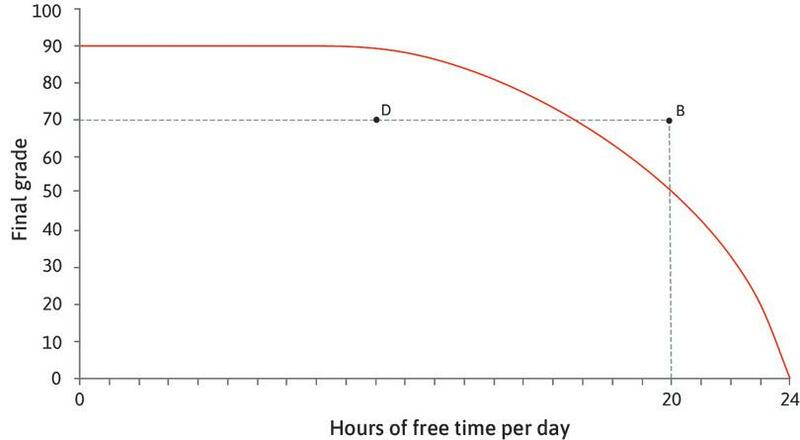 Figure 4.8d At H he is only willing to give up 4 points for an extra hour of free time. His MRS is 4. As we move down the indifference curve, the MRS diminishes, because points become scarce relative to free time. The indifference curve becomes flatter. Look at the combinations with 15 hours of free time. On the lowest curve, the grade is low and the MRS is small. Alexei would be willing to give up only a few points for an hour of free time. As we move up the vertical line, the indifference curves are steeper—the MRS increases. Figure 4.8e Look at the combinations with 15 hours of free time. On the lowest curve, the grade is low and the MRS is small. Alexei would be willing to give up only a few points for an hour of free time. As we move up the vertical line, the indifference curves are steeper—the MRS increases. Now look at all the combinations with a grade of 54. On the curve furthest to the left, free time is scarce and the MRS is high. As we move to the right along the red line, he is less willing to give up points for free time. The MRS decreases, the indifference curves get flatter. Figure 4.8f Now look at all the combinations with a grade of 54. On the curve furthest to the left, free time is scarce and the MRS is high. As we move to the right along the red line, he is less willing to give up points for free time. The MRS decreases, the indifference curves get flatter. The MRS is the slope of the indifference curve; it falls as we move to the right along the curve. If you move from one point to another in Figure 4.7, you can see that the indifference curves get flatter if you increase the amount of free time, and steeper if you increase the grade. When free time is scarce relative to grade points, Alexei is less willing to sacrifice an hour for a higher grade—his MRS is high and his indifference curve is steep. 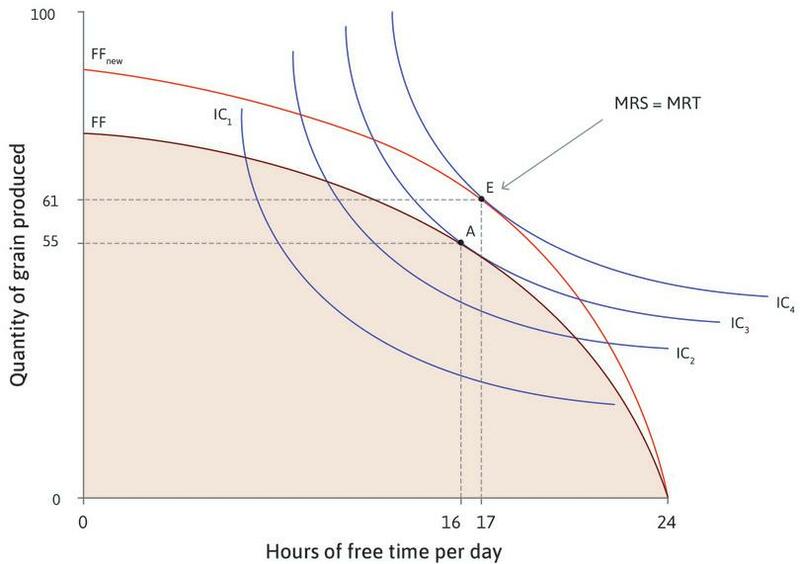 As the analysis in Figure 4.8 shows, if you move up the vertical line through 15 hours, the indifference curves get steeper—the MRS increases. For a given amount of free time, Alexei is willing to give up more grade points for an additional hour when he has a lot of points compared to when he has few (for example, if he was in danger of failing the course). By the time you reach A, where his grade is 84, the MRS is high; grade points are so plentiful here that he is willing to give up 9 percentage points for an extra hour of free time. You can see the same effect if you fix the grade and vary the amount of free time. If you move to the right along the horizontal line for a grade of 54, the MRS becomes lower at each indifference curve. As free time becomes more plentiful, Alexei becomes less and less willing to give up grade points for more time. In Figure 4.9, IC1 is an indifference curve joining all the combinations that give the same level of utility as A. Combination B is not on IC1. The trade-off between grades and work. Figure 4.9 The trade-off between grades and work. Does combination B give higher or lower utility than combination A? How do you know? Draw a sketch of the diagram, and add another indifference curve, IC2, that goes through B and crosses IC1. Label the point at which they cross as C.
Combinations B and C are both on IC2. What does that imply about their levels of utility? Combinations C and A are both on IC1. What does that imply about their levels of utility? According to your answers to (3) and (4), how do the levels of utility at combinations A and B compare? Now compare your answers to (1) and (5) and explain how you know that indifference curves can never cross. Imagine that you are offered at job at the end of your university course that requires you to work for 40 hours per week. This would leave you with 128 hours of free time per week. Estimate the weekly pay that you expect to receive (be realistic!). Draw a diagram with free time on the horizontal axis and weekly pay on the vertical axis, and plot the combination corresponding to your job offer, calling it A. Assume you need about 10 hours a day for sleeping and eating, so you may want to draw the horizontal axis with 70 hours at the origin. Now imagine you were offered another job requiring 45 hours of work per week. What level of weekly pay would make you indifferent between this and the original offer? By asking yourself more questions about the trade-offs you would make, plot an indifference curve through A to represent your preferences. Use your diagram to estimate your marginal rate of substitution between pay and free time at A. Based on Figure 4.7, which of the following statements are true? Alexei prefers C to B because at C he has more free time. Alexei is indifferent between the grade of 84 with 15 hours of free time, and the grade of 50 with 20 hours of free time. Alexei prefers D to C, because at D he has the same grade for more free time. At G, Alexei is willing to give up 2 hours of free time for 10 extra grade points. The indifference curve through C is lower than that through B. 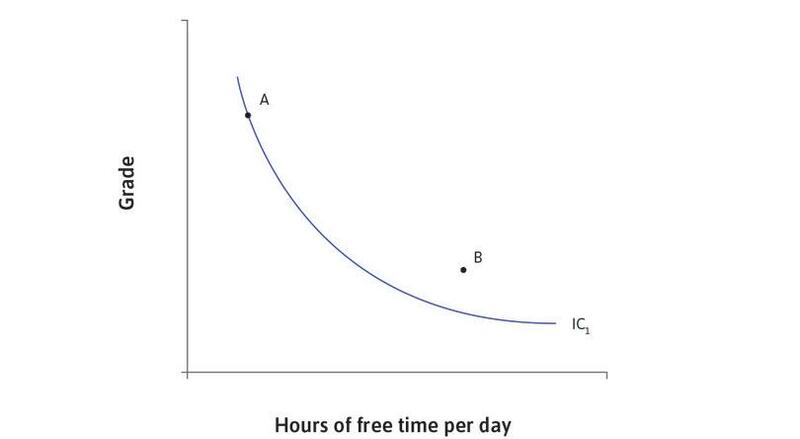 Hence, Alexei prefers B to C.
A (where Alexei has the grade of 84 and 15 hours of free time) and D (where Alexei has the grade of 50 with 20 hours of free time) are on the same indifference curve. At D, Alexei has the same amount of free time but a higher grade. The opposite trade-off is true. Going from G to D, Alexei is willing to give up 10 grade points for 2 extra hours of free time. Going from G to E, he is willing to give up 2 hours of free time for 15 extra grade points. The ratio of the amounts of the two goods at a point on the indifference curve. The amount of one good that the consumer is willing to trade for one unit of the other. The change in the consumer’s utility when one good is substituted for another. The slope of the indifference curve. The marginal rate of substitution represents the ratio of the trade-off at the margin; in other words, how much of one good the consumer is willing to sacrifice for one extra unit of the other. This is the definition of the marginal rate of substitution. The MRS is the amount of one good that can be substituted for one unit of the other while keeping utility constant. The slope of the indifference curve represents the marginal rate of substitution—the trade-off between two goods that keeps utility constant. Alexei faces a dilemma. We know from looking at his preferences that he wants both his grade and his free time to be as high as possible. But given his production function, he cannot increase his free time without getting a lower grade in the exam. Another way of expressing this is to say that free time has an opportunity cost—to get more free time, Alexei has to forgo the opportunity of getting a higher grade. In everyday decision making, opportunity costs are relevant whenever we consider choosing between alternative and mutually exclusive courses of action. When we consider the cost of taking action A, we include the fact that if we do A, we cannot do B. So ‘not doing B’ becomes part of the cost of doing A. This is called an opportunity cost because doing A means forgoing the opportunity to do B. Accountants think differently about costs. Imagine that an accountant and an economist have been asked to report the cost of going to a concert A in a theatre, which has a $25 admission cost. In a nearby park, there is concert B, which is free but happens at the same time. The cost of concert A is your ‘out-of-pocket’ cost—you paid $25 for a ticket, so the cost is $25. But what do you have to give up to go to concert A? You give up $25, plus the enjoyment of the free concert in the park. So the cost of concert A for you is the out-of-pocket cost plus the opportunity cost. Suppose that the most you would have been willing to pay to attend (if it wasn’t free) was $15. The benefit of your next best alternative to concert A would be $15 of enjoyment in the park. This is the opportunity cost of going to concert A. On the other hand, if you anticipate $35 worth of pleasure from concert A, then the economic cost of $40 means you will not choose to go to the theatre. In simple terms, given that you have to pay $25 for the ticket, you will instead opt for concert B, pocketing the $25 to spend on other things and enjoying $15 worth of benefit from the free park concert. Why don’t accountants think this way? Because it is not their job. Accountants are paid to keep track of money, not to provide decision rules on how to choose among alternatives, some of which do not have a stated price. But making sensible decisions and predicting how sensible people will make decisions involve more than keeping track of money. An accountant might argue that the park concert is irrelevant. Whether or not there is a free park concert does not affect the cost of going to the concert A. The cost to you is always $25. But whether or not there is a free park concert can affect whether you go to concert A or not, because it changes your available options. If your enjoyment from concert A is $35 and your next best alternative is staying at home, with enjoyment of $0, you will choose concert A. However, if concert B is available, you will choose it rather than concert A. The table in Figure 4.10 summarizes the example of your choice of which concert to attend. Decision A: Go to the theatre concert. B: Go to the park concert. Opportunity costs and decision making: Which concert will you choose? Figure 4.10 Opportunity costs and decision making: Which concert will you choose? The British government introduced legislation in 2012 that gave universities the option to raise their tuition fees. Most chose to increase annual tuition fees from £3,000 to £9,000. From the viewpoint of an accountant, does this mean that the cost of going to university has tripled? What would an economist’s viewpoint be? You are a taxi driver in Melbourne who earns A$50 for a day’s work. You have been offered a one-day ticket to the Australian Open for A$40. Being a big tennis fan, you value the experience at A$100. Based on this information, which of the following statements is true? The opportunity cost of the day at the Open is A$40. The economic cost of the day at the Open is A$40. The enjoyment minus economic cost of the day at the Open is A$10. You would be willing to pay up to A$100 for the ticket. By going to the Open, you are foregoing the opportunity of earning A$50 from taxi driving. This is your opportunity cost. The economic cost is the sum of the actual price you pay plus the opportunity cost, which in this case is A$40 + A$50 = A$90. The benefit minus economic cost (out-of-pocket plus opportunity costs) of an action is the economic rent of an action. In this case, the economic rent is A$100 – A$40 – A$50 = A$10. The maximum price you would have paid for the ticket is the price at which your economic rent would be zero, which in this case is A$50. Now we return to Alexei’s problem of how to choose between high grades and free time. Free time has an opportunity cost in the form of lost percentage points in his grade (equivalently, we might say that percentage points have an opportunity cost in the form of the free time Alexei gives up to obtain them). But before we can describe how Alexei resolves his dilemma, we need to work out precisely which alternatives are available to him. To answer this question, we look again at the production function. This time, we will show how the final grade depends on the amount of free time, rather than study time. There are 24 hours in a day. Alexei must divide this time between studying (all the hours devoted to learning) and free time (all the rest of his time). Figure 4.11 shows the relationship between his final grade and hours of free time per day—the mirror image of Figure 4.6. If Alexei studies solidly for 24 hours, that means zero hours of free time and a final grade of 90. If he chooses 24 hours of free time per day, we assume he will get a grade of zero. 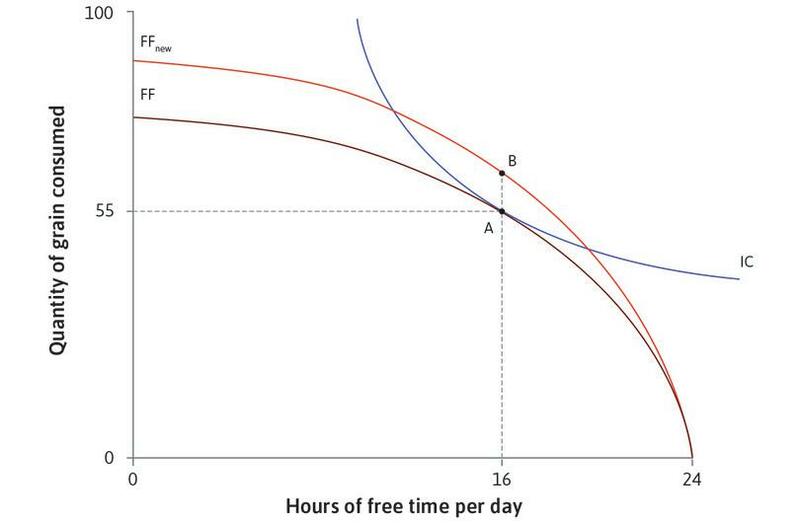 In Figure 4.11, the axes are ‘final grade’ and ‘free time’, the two goods that give Alexei utility. If we think of him choosing to consume a combination of these two goods, the curved line in Figure 4.11 shows the boundary of what is feasible. The line is his feasible frontier—the highest grade he can achieve given the amount of free time he takes, and the area inside the frontier is the feasible set. Follow the analysis of Figure 4.11 to see which combinations of grade and free time are feasible, and which are not, and how the slope of the frontier represents the opportunity cost of free time. How does Alexei’s choice of free time affect his grade? 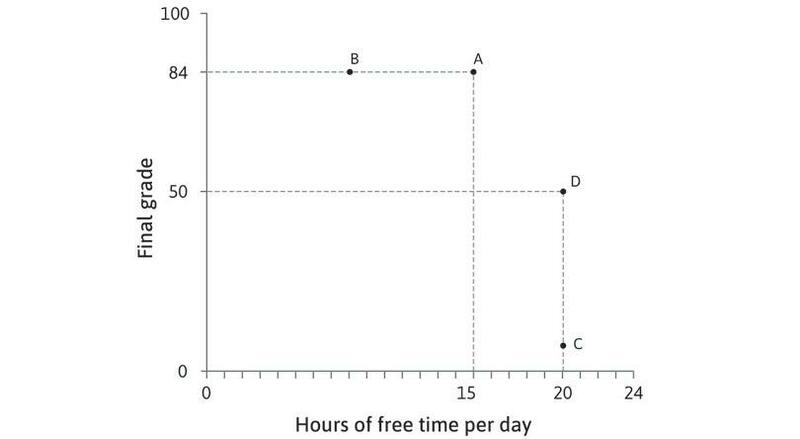 Figure 4.11 How does Alexei’s choice of free time affect his grade? This curve is called the feasible frontier. It shows the highest final exam grade Alexei can achieve, given the amount of free time he takes. With 24 hours of free time, his grade would be zero. By having less free time, Alexei can achieve a higher grade. Figure 4.11a This curve is called the feasible frontier. It shows the highest final exam grade Alexei can achieve, given the amount of free time he takes. With 24 hours of free time, his grade would be zero. By having less free time, Alexei can achieve a higher grade. If Alexei chooses 13 hours of free time per day, he can achieve a grade of 84. Figure 4.11b If Alexei chooses 13 hours of free time per day, he can achieve a grade of 84. Given Alexei’s abilities and conditions of study, under normal conditions he cannot take 20 hours of free time and expect to get a grade of 70 (remember, we are assuming that luck plays no part). Therefore, B is an infeasible combination of hours of free time and exam grade. Figure 4.11c Given Alexei’s abilities and conditions of study, under normal conditions he cannot take 20 hours of free time and expect to get a grade of 70 (remember, we are assuming that luck plays no part). Therefore, B is an infeasible combination of hours of free time and exam grade. The maximum grade Alexei can achieve with 19 hours of free time per day is 57. Figure 4.11d The maximum grade Alexei can achieve with 19 hours of free time per day is 57. Combination D is feasible, but Alexei is wasting time or points in the exam. He could get a higher grade with the same hours of study per day, or have more free time and still get a grade of 70. Figure 4.11e Combination D is feasible, but Alexei is wasting time or points in the exam. He could get a higher grade with the same hours of study per day, or have more free time and still get a grade of 70. At combination A, Alexei could get an extra hour of free time by giving up 3 points in the exam. The opportunity cost of an hour of free time at A is 3 points. Figure 4.11g At combination A, Alexei could get an extra hour of free time by giving up 3 points in the exam. The opportunity cost of an hour of free time at A is 3 points. The more free time he takes, the higher the marginal product of studying, so the opportunity cost of free time increases. At C, the opportunity cost of an hour of free time is higher than at A—Alexei would have to give up 7 points instead of 3. 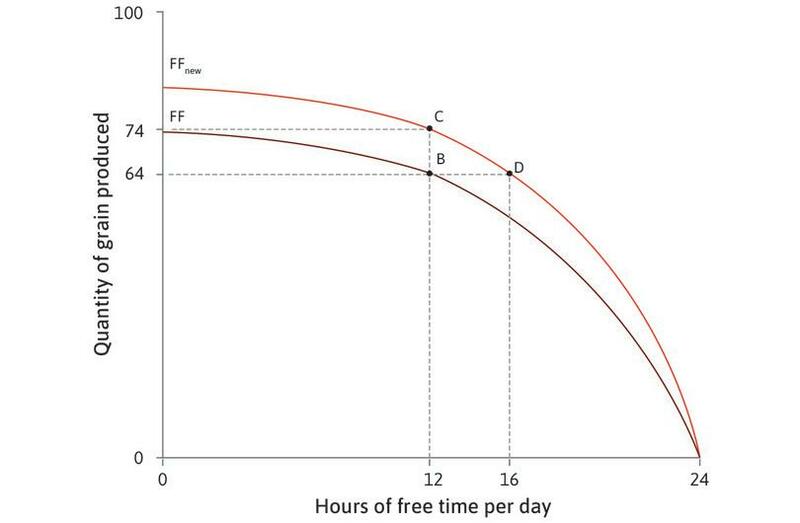 Figure 4.11h The more free time he takes, the higher the marginal product of studying, so the opportunity cost of free time increases. At C, the opportunity cost of an hour of free time is higher than at A—Alexei would have to give up 7 points instead of 3. The opportunity cost of free time at C is 7 points, corresponding to the slope of the feasible frontier. At C, Alexei would have to give up 7 percentage points (the vertical change is −7) to increase his free time by 1 hour (the horizontal change is 1). The slope is −7. Figure 4.11i The opportunity cost of free time at C is 7 points, corresponding to the slope of the feasible frontier. At C, Alexei would have to give up 7 percentage points (the vertical change is −7) to increase his free time by 1 hour (the horizontal change is 1). The slope is −7. Any combination of free time and final grade that is on or inside the frontier is feasible. Combinations outside the feasible frontier are said to be infeasible given Alexei’s abilities and conditions of study. On the other hand, even though a combination lying inside the frontier is feasible, choosing it would imply Alexei has effectively thrown away something that he values. If he studied for 14 hours a day, then according to our model, he could guarantee himself a grade of 89. But he could obtain a lower grade (70, say), if he just stopped writing before the end of the exam. It would be foolish to throw away points like this for no reason, but it would be possible. Another way to obtain a combination inside the frontier might be to sit in the library doing nothing—Alexei would be taking less free time than is available to him, which again makes no sense. By choosing a combination inside the frontier, Alexei would be giving up something that is freely available—something that has no opportunity cost. He could obtain a higher grade without sacrificing any free time, or have more time without reducing his grade. The feasible frontier is a constraint on Alexei’s choices. It represents the trade-off he must make between grade and free time. At any point on the frontier, taking more free time has an opportunity cost in terms of grade points foregone, corresponding to the slope of the frontier. Another way to express the same idea is to say that the feasible frontier shows the marginal rate of transformation (MRT)—the rate at which Alexei can transform free time into grade points. Look at the slope of the frontier between points A and E in Figure 4.11. The slope of AE: This is the vertical distance from A to E divided by horizontal distance from A to E. It is −3. At point A: Alexei could get 1 more unit of free time by giving up 3 grade points. The opportunity cost of a unit of free time is 3. At point E: Alexei could transform 1 unit of time into 3 grade points. The marginal rate at which he can transform free time into grade points is 3. Note that the slope of AE is only an approximation to the slope of the frontier. More precisely, the slope at any point is the slope of the line that just touches the frontier, and this represents both the MRT and the opportunity cost at that point. The marginal rate of substitution (MRS): In the previous section, we saw that the MRS measures the trade-off that Alexei is willing to make between exam grade and free time. The marginal rate of transformation (MRT): In contrast, the MRT measures the trade-off that Alexei is constrained to make by the feasible frontier. As we shall see in the next section, the choice Alexei makes between his grade and his free time will strike a balance between these two trade-offs. Figure 4.11 shows Alexei’s production function, which describes how his final grade (the output) depends on the number of hours spent studying (the input). Free time per day is given by 24 hours minus the number of hours of study. Based on this information and the figure, which of the following statements is true? To find the feasible set, one needs to know the number of hours that Alexei sleeps per day. The feasible frontier is a mirror image of the production function. If the production function is horizontal after 15 hours of study per day, the feasible frontier is horizontal between 0 and 10 hours of free time per day. The marginal product at 10 hours of study equals the marginal rate of transformation at 14 hours of free time. The hours of free time per day are already given as 24 hours minus the hours of study per day. Therefore, the number of hours spent sleeping is included in the hours of free time. The production function isthe same as the feasible frontier, except that it takes negative free time (hours of study) as its input. The production function is therefore the feasible frontier mirrored across the vertical axis and shifted horizontally. The production function is horizontal after 15 hours of study per day. Therefore, the feasible frontier is horizontal only up to 9 hours of free time per day. 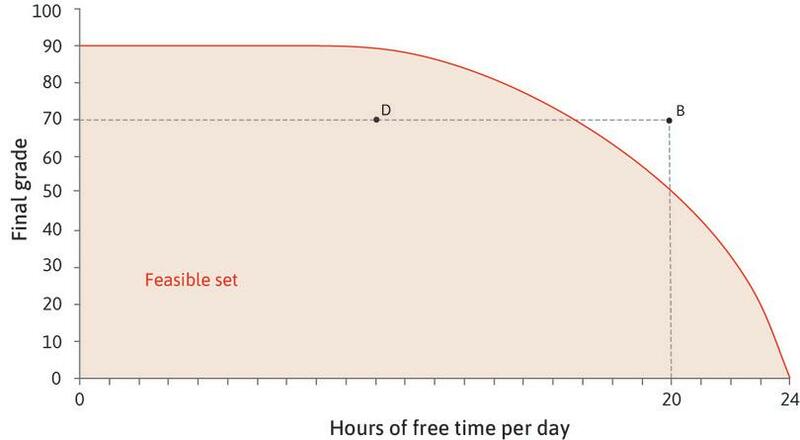 Ten hours of study is equivalent to 14 hours of free time in a 24-hour day, and the marginal product of labour (additional output per labour hour) is the same as the marginal rate of transformation (trade-off between extra output and labour), so these two values are equal. Consider a student whose final grade increases with the number of hours spent studying. Her choice is between more free time and higher grades, both of which are ‘goods’. Which of the following are the same as her marginal rate of transformation between the two goods? The marginal rate of transformation is equal to all of these. The final step in this decision-making process is to determine the combination of final grade and free time that Alexei will choose. Figure 4.12a brings together his feasible frontier (Figure 4.11) and indifference curves (Figure 4.7). Recall that the indifference curves indicate what Alexei prefers, and their slopes show the trade-offs that he is willing to make; the feasible frontier is the constraint on his choice, and its slope shows the trade-off he is constrained to make. Figure 4.12a shows four indifference curves, labelled IC1 to IC4. IC4 represents the highest level of utility because it is the furthest away from the origin. 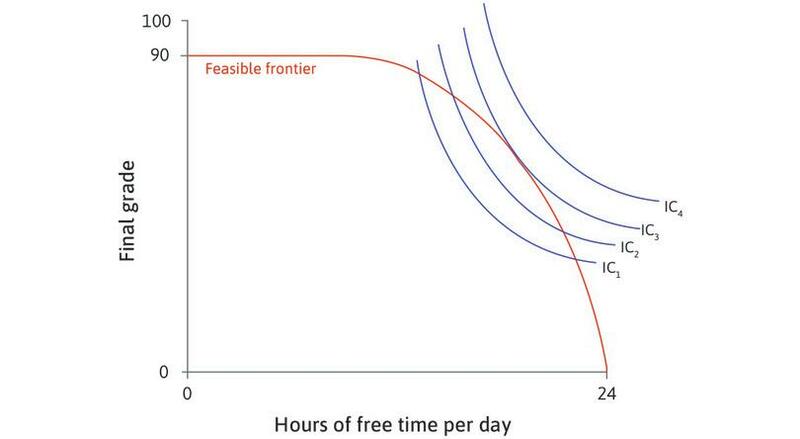 No combination of grade and free time on IC4 is feasible, however, because the whole indifference curve lies outside the feasible set. Suppose that Alexei considers choosing a combination somewhere in the feasible set, on IC1. By looking at the analysis of Figure 4.12a, you will see that he can increase his utility by moving to points on higher indifference curves until he reaches a feasible choice that maximizes his utility. How many hours does Alexei decide to study? Figure 4.12a How many hours does Alexei decide to study? Which point will Alexei choose? The diagram brings together Alexei’s indifference curves and his feasible frontier. Figure 4.12a-a The diagram brings together Alexei’s indifference curves and his feasible frontier. On the indifference curve IC1, all combinations between A and B are feasible because they lie in the feasible set. Suppose Alexei chooses one of these points. Figure 4.12a-b On the indifference curve IC1, all combinations between A and B are feasible because they lie in the feasible set. Suppose Alexei chooses one of these points. All combinations in the lens-shaped area between IC1 and the feasible frontier are feasible, and give higher utility than combinations on IC1. For example, a movement to C would increase Alexei’s utility. Figure 4.12a-c All combinations in the lens-shaped area between IC1 and the feasible frontier are feasible, and give higher utility than combinations on IC1. For example, a movement to C would increase Alexei’s utility. Moving from IC1 to point C on IC2 increases Alexei’s utility. Switching from B to D would raise his utility by an equivalent amount. Figure 4.12a-d Moving from IC1 to point C on IC2 increases Alexei’s utility. Switching from B to D would raise his utility by an equivalent amount. Alexei can raise his utility by moving into the lens-shaped area above IC2. He can continue to find feasible combinations on higher indifference curves, until he reaches E.
Figure 4.12a-e Alexei can raise his utility by moving into the lens-shaped area above IC2. He can continue to find feasible combinations on higher indifference curves, until he reaches E.
At E, he has 19 hours of free time per day and a grade of 57. Alexei maximizes his utility—he is on the highest indifference curve obtainable, given the feasible frontier. Figure 4.12a-f At E, he has 19 hours of free time per day and a grade of 57. Alexei maximizes his utility—he is on the highest indifference curve obtainable, given the feasible frontier. At E, the two curves touch but do not cross. The marginal rate of substitution (the slope of the indifference curve) is equal to the marginal rate of transformation (the slope of the frontier). Figure 4.12a-g At E, the two curves touch but do not cross. The marginal rate of substitution (the slope of the indifference curve) is equal to the marginal rate of transformation (the slope of the frontier). The slope of the indifference curve is the MRS: It is the trade-off he is willing to make between free time and percentage points. The slope of the frontier is the MRT: It is the trade-off that he is constrained to make between free time and percentage points because it is not possible to go beyond the feasible frontier. Alexei achieves the highest possible utility where the two trade-offs just balance (E). His optimal combination of grade and free time is at the point where the marginal rate of transformation is equal to the marginal rate of substitution. Figure 4.12b lists the MRS (slope of indifference curve) and MRT (slope of feasible frontier) at the points shown in Figure 4.12a. At B and D, the number of points Alexei is willing to trade for an hour of free time (MRS) is greater than the opportunity cost of that hour (MRT), so he prefers to increase his free time. At A, the MRT is greater than the MRS so he prefers to decrease his free time. And, as expected, at E the MRS and MRT are equal. Figure 4.12b How many hours does Alexei decide to study? We have modelled the student’s decision on study hours as what we call a constrained choice problem—a decision-maker (Alexei) pursues an objective (utility maximization in this case) subject to a constraint (his feasible frontier). Free time and grades are goods: Alexei values both of them. Each has an opportunity cost: More of one good means less of the other. The table in Figure 4.13 summarizes Alexei’s trade-offs. In our model of decision making, grade points and free time are scarce. Describe a situation in which Alexei’s grade points and free time would not be scarce. Remember, scarcity depends on both his preferences and the production function. Figure 4.12a shows Alexei’s feasible frontier and his indifference curves for final exam grade and hours of free time per day. Suppose that all students have the same feasible frontier, but their indifference curves may differ in shape and slope depending on their preferences. Use the diagram to decide which of the following statements are true. Alexei will choose a point where the marginal rate of substitution equals the marginal rate of transformation. C is below the feasible frontier, but D is on the feasible frontier. Therefore, Alexei may select point D as his optimal choice. All students with downward-sloping indifference curves, whatever the slope, would choose point E.
At E, Alexei has the highest ratio of final exam mark per hour of free time per day. If Alexei were at a point on the feasible frontier where MRS ≠ MRT, then he would be willing to give up more of one good than would actually be necessary to get some of the other. Therefore, he will choose to do so until he reaches a point where MRS = MRT. Along the feasible frontier, Alexei would be on a higher indifference curve at E than at D. Therefore, point D is not the optimal choice. Students with flatter indifference curves (those who are more willing to sacrifice more hours of free time for the same number of extra marks) have a lower marginal rate of substitution. Therefore, they will choose bundles to the left of E (such as D) where their indifference curves touch but do not cross the feasible frontier. The points along the feasible frontier to the left of E have higher ratios of final exam mark per hour of free time, but are not optimal. The optimal point is where marginal rate of substitution equals marginal rate of transformation. New technologies raise the output produced per hour of labour. This is called the average product or labour productivity. We now have the tools to analyse the effects of increased productivity on living standards, specifically on incomes and free time. So far, we have considered Alexei’s choice between studying and free time. We now apply our model of constrained choice to Angela, a self-sufficient farmer who chooses how many hours to work. We assume that Angela produces grain to eat and does not sell it to anyone else. If she produces too little grain, she will starve. What is stopping her producing more than enough grain? Like the student, Angela also values free time—she gets utility from both free time and consuming grain. As a result, her choice is constrained. Producing grain takes labour time, and each hour of labour means Angela foregoes an hour of free time. The hour of free time sacrificed is the opportunity cost of the grain produced. Like Alexei, Angela faces a problem of scarcity. She has to make a choice between her consumption of grain and her consumption of free time. To understand her choice and how it is affected by technological progress (as in Unit 1), we need to model her production function and her preferences. Figure 4.14 shows the initial production function before the change occurs, which is the relationship between the number of hours worked and the amount of grain produced. Notice that the graph has a similar concave shape to Alexei’s production function. The marginal product of an additional hour’s work, shown by the slope, diminishes as the number of hours increases. A technological improvement—such as seeds with a higher yield, or better equipment that makes harvesting quicker—will increase the amount of grain produced in a given number of hours. The analysis in Figure 4.14 demonstrates the effect on the production function. How technological change affects the production function. Figure 4.14 How technological change affects the production function. The table shows how the amount of grain produced depends on the number of hours worked per day. For example, if Angela works for 12 hours a day, she will produce 64 units of grain. This is point B on the graph. Figure 4.14a The table shows how the amount of grain produced depends on the number of hours worked per day. For example, if Angela works for 12 hours a day, she will produce 64 units of grain. This is point B on the graph. An improvement in technology means that more grain is produced for a given number of working hours. The production function shifts upward, from PF to PFnew. Figure 4.14b An improvement in technology means that more grain is produced for a given number of working hours. The production function shifts upward, from PF to PFnew. If Angela works for 12 hours per day, she can produce 74 units of grain (point C). Figure 4.14c If Angela works for 12 hours per day, she can produce 74 units of grain (point C). Alternatively, by working 8 hours a day, she can produce 64 units of grain (point D), which previously took 12 hours. Figure 4.14d Alternatively, by working 8 hours a day, she can produce 64 units of grain (point D), which previously took 12 hours. The average product at a particular point is the slope of the ray from that point to the origin. For example, at point B, Angela’s average product is 64/12 = 5.33 units per hour. Figure 4.14e The average product at a particular point is the slope of the ray from that point to the origin. For example, at point B, Angela’s average product is 64/12 = 5.33 units per hour. After technological improvement, Angela’s average product from working the same number of hours is now 74/12 = 6.17 units per hour. Figure 4.14f After technological improvement, Angela’s average product from working the same number of hours is now 74/12 = 6.17 units per hour. Notice that the new production function is steeper than the original one for every given number of hours. The new technology has increased Angela’s marginal product of labour. At every point, an additional hour of work produces more grain than under the old technology. Based on Figure 4.14, which of the following statements about marginal and average product are true? The marginal product and average product are approximately the same for the initial hour. For 2 hours of work, the average product is less than the marginal product. The average product is the same for 11 and 12 hours of work. Both the average product and marginal product are diminishing. Because there are no previous hours to consider, the average product for the initial hour is just the improvement produced by a single hour, which in turn approximates to the marginal product from 0 to 1 hours (the precise marginal product changes over this interval, reflected in the decreasing slope of the production function). For 2 hours of work, the average product is 9, which is greater than the marginal product (8). For 11 hours of work, the average product is 62/11 = 5.64, which is greater than the average product at 12 hours of work (64/12 = 5.33). The slope of the line that touches but does not cross the production function becomes less steep as hours of work increase. Likewise, the slope of the ray from the origin to a point on the production function become less steep at higher hours of work. Figure 4.15 shows Angela’s feasible frontier, which is just the mirror image of the production function, for the original technology (FF), and the new one (FFnew). As before, what we call free time is all the time that is not spent working to produce grain—it includes time for eating, sleeping, and everything else that we don’t count as farm work, as well as her leisure time. The feasible frontier shows how much grain can be consumed for each possible amount of free time. Points B, C, and D represent the same combinations of free time and grain as in Figure 4.14. The slope of the frontier represents the MRT (the marginal rate at which free time can be transformed into grain) or, equivalently, the opportunity cost of free time. You can see that technological progress expands the feasible set, giving her a wider choice of combinations of grain and free time. An improvement in technology expands Angela’s feasible set. Figure 4.15 An improvement in technology expands Angela’s feasible set. Now we add Angela’s indifference curves to the diagram, representing her preferences for free time and grain consumption, in order to find which combination in the feasible set is best for her. Figure 4.16 shows that her optimal choice under the original technology is to work for 8 hours a day, giving her 16 hours of free time and 55 units of grain. This is the point of tangency, where her two trade-offs balance out—her marginal rate of substitution (MRS) between grain and free time (the slope of the indifference curve) is equal to the MRT (the slope of the feasible frontier). We can think of the combination of free time and grain at point A as a measure of her standard of living. Follow the analysis of Figure 4.16 to see how her choice changes as a result of technological progress. Angela’s choice between free time and grain. Figure 4.16 Angela’s choice between free time and grain. The diagram shows the feasible set with the original production function and Angela’s indifference curves for combinations of grain and free time. The highest indifference curve she can attain is IC3 at point A. Figure 4.16a The diagram shows the feasible set with the original production function and Angela’s indifference curves for combinations of grain and free time. The highest indifference curve she can attain is IC3 at point A. She enjoys 16 hours of free time per day and consumes 55 units of grain. At A, her MRS is equal to the MRT. Figure 4.16b She enjoys 16 hours of free time per day and consumes 55 units of grain. At A, her MRS is equal to the MRT. An improvement in technology expands the feasible set. Now she can do better than at A. Figure 4.16c An improvement in technology expands the feasible set. Now she can do better than at A. When the technology of farming has improved, Angela’s optimal choice is point E, where FFnew just touches indifference curve IC4. She has more free time and more grain than before. 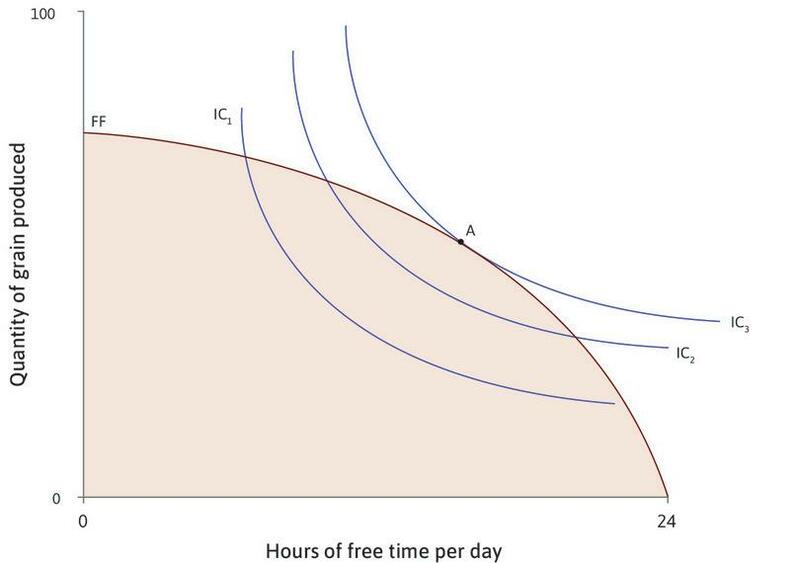 Figure 4.16d When the technology of farming has improved, Angela’s optimal choice is point E, where FFnew just touches indifference curve IC4. She has more free time and more grain than before. Technological change raises Angela’s standard of living—it enables her to achieve higher utility. Note that in Figure 4.16, she increases both her consumption of grain and her free time. It is important to realize that this is just one possible result. Had we drawn the indifference curves differently, Angela’s trade-offs would have been different. We can say that the improvement in technology definitely makes it feasible to both consume more grain and have more free time, but whether Angela will choose to have more of both depends on her preferences between these two goods, and her willingness to substitute one for the other. To understand why, remember that technological change makes the production function steeper—it increases Angela’s marginal product of labour. This means that the opportunity cost of free time is higher, giving her a greater incentive to work. But also, now that she can have more grain for each hour of free time, she may be more willing to give up some grain for more free time—that is, to reduce her hours of work. These two effects of technological progress work in opposite directions. In Figure 4.16, the second effect dominates and she chooses point E, with more free time as well as more grain. Think back to the constrained choice problem of final grade and study hours. What could bring about a technological improvement in your and your fellow students’ production functions? Draw a diagram to illustrate how this improvement would affect your feasible set of grades and study hours. Analyse what might happen to your choice of study hours, and the choices that you might make. The following diagram shows a farmer’s choice between free time and grain before and after an improvement in technology. A farmer’s choice between free time and grain. Figure 4.17 A farmer’s choice between free time and grain. If the MRS of the indifference curve at B is larger than the MRS of the indifference curve at A, then the farmer will have an incentive to take more free time after the technology improvement. The MRT of the new feasible frontier at B is larger than the MRT of the old feasible frontier at A. This gives the farmer an incentive to take more free time after the technology improvement. The farmer may choose a point on either side of B after the technology improvement. The farmer will definitely choose a point to the right of B after the technology improvement. A larger MRS means that the farmer is willing to sacrifice more grain for an extra hour of free time, which gives him an incentive to take more free time than before. A larger MRT implies that each additional hour of free time incurs a greater opportunity cost in forgone consumption of grain than before. This gives the farmer an incentive to take less free time than before. This is true; it depends on the relative size of the incentive to take more free time induced by a higher MRS and the incentive to work more induced by a higher MRT at B. 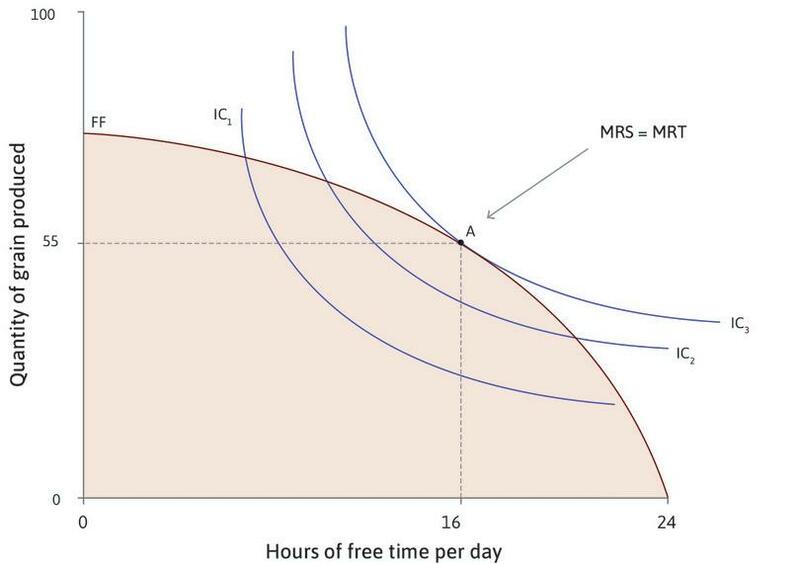 The chosen point can be to the left of B, if the incentive to take more free time (induced by a larger MRS) is more than offset by the incentive to work more (induced by a larger MRT). A good for which demand increases when a person’s income rises, holding prices unchanged. We can think through how the technological change and rising incomes described in Unit 1 affected the trade-off faced by workers. Higher wages meant it was possible to have both higher consumption and more free time. And, like Angela, workers wanted more of both. In economics, the term normal good is used when more of something is demanded as income rises. Using this definition, both consumption and free time are normal goods. We use the idea of the two effects of technological progress on Angela’s choice of free time to explore what has happened to working hours over the past 250 years. Income effect: The higher income from every hour of work has made workers better off. This is called the income effect—it means that workers want to have more hours of free time (as well as more consumption). Substitution effect: The higher reward from working an extra hour has increased the incentive to work. This is called the substitution effect—it has the effect of reducing hours of free time. Let’s consider first the period before 1870 in Britain, when both wages and working hours rose. Income effect: At this time, there was a relatively low level of consumption. Workers’ willingness to substitute free time for goods did not increase much when rising wages made higher consumption possible. The income effect resulting in the choice of more free time was small. Substitution effect: Technology improved. Workers were more productive and paid more, so each hour of work brought more rewards than before in the form of goods, increasing the incentive to work longer hours. The substitution effect resulting in the choice of less free time was large. The substitution effect dominated: Work hours rose, which can be interpreted as saying that the substitution effect (free time falls) was bigger than the income effect (free time rises). To see how to use a diagram to represent the income and substitution effects, see Section 3.7 of The Economy. Income effect: By the late nineteenth century, workers had a higher level of consumption and valued free time relatively more, so the income effect of a wage increase was larger. Substitution effect: This was consistent with the period before 1870. The income effect dominated: When the income effect began to outweigh the substitution effect, working time fell. Fogel estimated that, in 1880, lifetime leisure time was just a quarter of lifetime work hours. In 1995, lifetime leisure time exceeded lifetime working time. He predicted that lifetime leisure would be three times lifetime working hours by the year 2040. His estimates are shown in Figure 4.18. 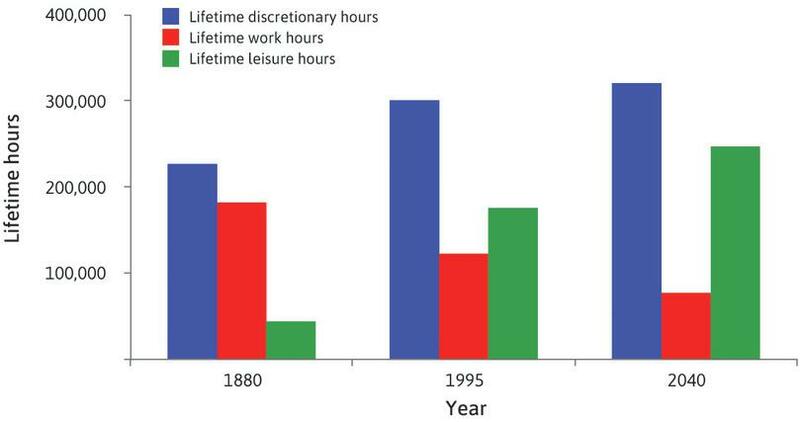 Estimated lifetime hours of work and leisure (1880, 1995, 2040). 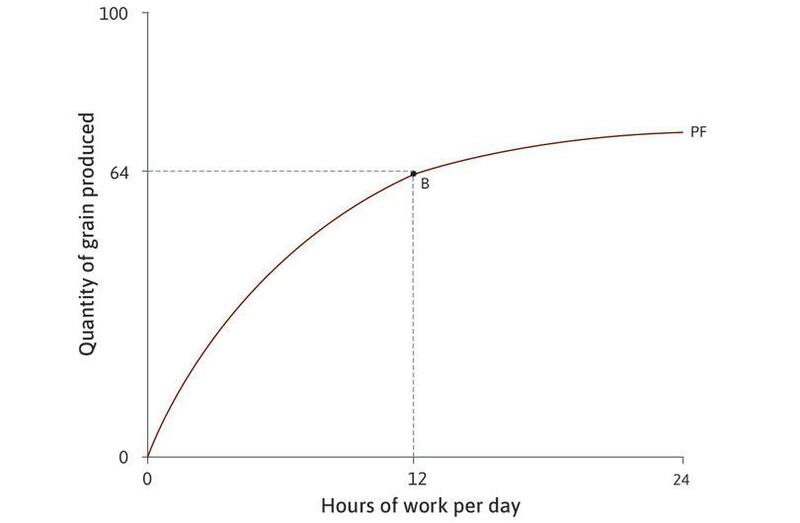 Figure 4.18 Estimated lifetime hours of work and leisure (1880, 1995, 2040). Robert William Fogel. 2000. The Fourth Great Awakening and the Future of Egalitarianism. Chicago: University of Chicago Press. It is possible that Fogel overstated the future decline in working time, as Keynes once did. But he raises the challenging possibility that one of the great changes brought about by the technological revolution could be a vastly reduced role of work in the life of an average person. In the period before 1870 in Britain, both wages and hours worked rose, while in the twentieth century, working hours fell even though wages continued to rise. Based on this information, which of the following statements are correct? The marginal rate of transformation between consumption and free time rose from the pre-1870s to the twentieth century. In the period before 1870, the positive substitution and income effects of rising wages led to workers taking less free time. From the pre-1870s to the twentieth century, the substitution effect of a rise in the wage rate on the hours of free time changed from negative to positive. In the twentieth century, the substitution effect dominated the income effect, so that hours of free time rose. The wage rate is the MRT, which has risen over time. A higher wage rate means a higher opportunity cost of free time. Therefore, the substitution effect is negative. The number of hours of free time rose because the positive income effect more than offset the negative substitution effect. A higher wage rate means a higher opportunity cost of free time. Therefore, the substitution effect is always negative. In the twentieth century, the positive income effect dominated the negative substitution effect, so that hours of free time rose. Brian Burgoon and Phineas Baxandall explore the differences between the average hours that people spend at work in different developed countries, and argue that cultural and economic differences have created three different ‘worlds’ in this paper: Brian Burgoon and Phineas Baxandall. 2004. ‘Three Worlds of Working Time: The Partisan and Welfare Politics of Work Hours in Industrialized Countries.’ Politics & Society 32 (4): 439–73. 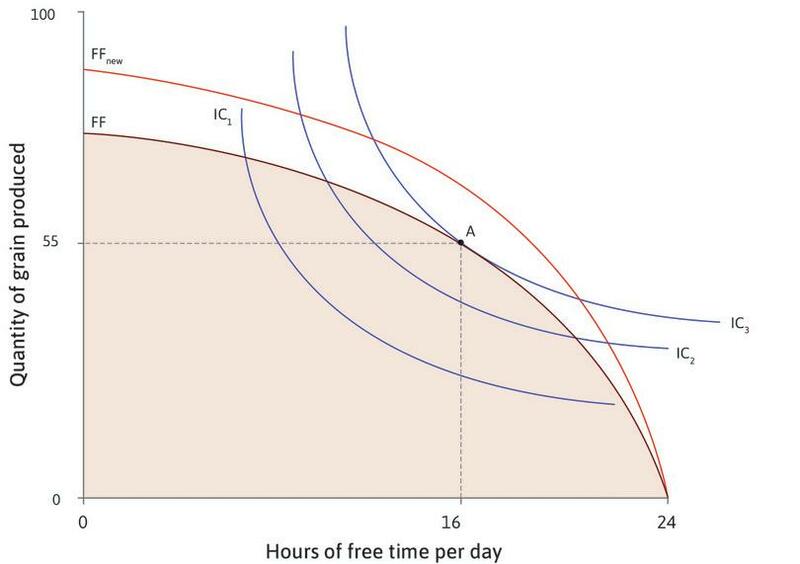 Figure 4.3 showed that, in countries with higher income (GDP per capita), workers tend to have more free time; it also showed that there are big differences in annual hours of free time between countries with similar income levels. 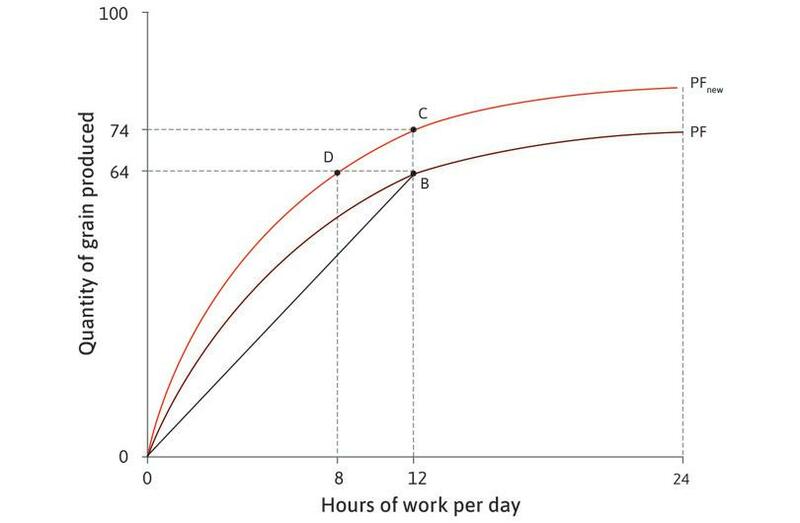 The table in Figure 4.19 shows our calculations of the disposable income of an average employee per hour worked, his or her free time per day, and the maximum amount that could be consumed per day. The figures are shown for five countries. Free time and consumption per day across countries (2013). 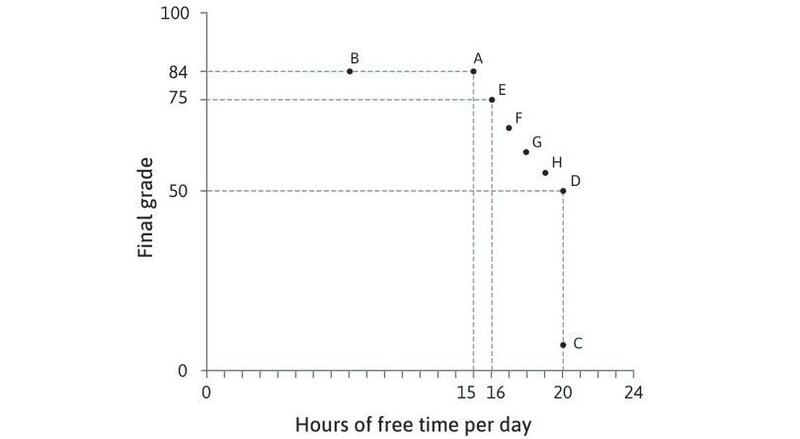 Figure 4.19 Free time and consumption per day across countries (2013). OECD. Average annual hours actually worked per worker. Accessed June 2016. Net income after taxes calculated in US dollars using PPP exchange rates. From the data in Figure 4.19, we see that average free time in Mexico and South Korea was virtually the same, although the wage was much higher in South Korea than in Mexico. South Koreans, Americans and Dutch people have about as much to spend per day, but South Koreans have between one and two hours less of free time. Could it be that South Koreans have the same preferences as Americans, so that, if the wage increased in South Korea, they would make the same choice? This seems unlikely—the substitution effect would lead them to consume more goods and take less free time; it is implausible to suppose that the income effect of a wage increase would lead them to consume fewer goods. More plausible is the hypothesis that South Koreans and Americans (on average) have different preferences. In particular, the idea that South Koreans work exceptionally hard is consistent with the hypothesis that the average American is willing to give up more units of daily goods for an hour of free time than the average South Korean. We have looked at three different contexts in which people decide how long to spend working—a student (Alexei), a farmer (Angela), and wage earners in different countries. We have used a model of preferences and feasible sets in which their best (utility-maximizing) choice is the level of working hours at which the slope of the feasible frontier is equal to the slope of the indifference curve. You may have been thinking that this is not what people do in real life! Billions of people organize their working lives without knowing anything about MRS and MRT (if they did make decisions that way, perhaps we would have to subtract the hours they would spend making calculations). And even if they did make their choice using mathematics, most of us can’t just leave work whenever we want to. So how can this model be useful? Remember that models help us ‘see more by looking at less’. Lack of realism is an intentional feature of any model. Does it matter that people (mostly) do not really optimize? Is it possible that a model that ignores how we think is a good model of how we choose? Milton Friedman, an economist, explained that, when economists use models in this way, they do not claim that we actually think through these calculations (such as equating MRS to MRT) each time we make a decision. Instead, we each try various choices (sometimes not even intentionally) and we tend to adopt habits, or rules of thumb, that make us feel satisfied and not regret our decisions. Consider the problem of predicting the shots made by an expert billiard player. It seems not at all unreasonable that excellent predictions would be yielded by the hypothesis that the billiard player made his shots as if he knew the complicated mathematical formulas that would give the optimum directions of travel, could estimate accurately by eye the angles, etc., describing the location of the balls, could make lightning calculations from the formulas, and could then make the balls travel in the direction indicated by the formulas. Similarly, if we see a person regularly choosing to go to the library after lectures instead of going out, or not putting in much work on their farm, or asking for longer shifts after a pay rise, we do not need to suppose that this person has done the calculations we set out. If that person later regretted the choice, next time they might go out a bit more, work harder on the farm, or cut their hours back. Eventually, we could speculate they might end up with a decision on work time that is close to the result of our calculations. This is why economic theory can help to explain—and sometimes even predict—what people do, even though those people are not performing the mathematical calculations that economists make in their models. A second unrealistic aspect of the model is that employers typically choose working hours, not individual workers, and employers often impose a longer working day than workers prefer. As a result, the hours that many people work are regulated by law, so that neither the employee nor the employer can choose to work beyond the maximum amount. In this case, the government has limited the feasible set of hours and goods. Although individual workers often have little freedom to choose their hours, workers’ preferences may nevertheless be reflected by changes in working hours over time and differences between countries. If many individual workers in a democracy wish to lower their hours, they may ‘choose’ this indirectly as voters, if not individually as workers. Or they may bargain as members of a trade union for contracts requiring employers to pay higher overtime rates for longer hours. Cultures differ. Some northern European peoples highly value their vacation times, while South Korea is famous for the long hours that employees put in. Legal limits on working time differ. In Belgium and France, the normal work week is limited to 35–39 hours, while in Mexico the limit is 48 hours, and in Kenya even longer. Employers have an incentive to take account of these differences. For example, employers who advertise jobs with the working hours that most people prefer may find they have more applicants than other employers offering too many (or too few) hours. Remember, we also judge the quality of a model by whether it provides insight into something that we want to understand. You can make a judgement as to whether our model of the choice of hours of work helps us understand why working hours differ so much between countries and why they have changed over time. Give an example from this unit to illustrate the way that economics studies human behaviour as a relationship between ‘given ends and scarce means with alternative uses’. 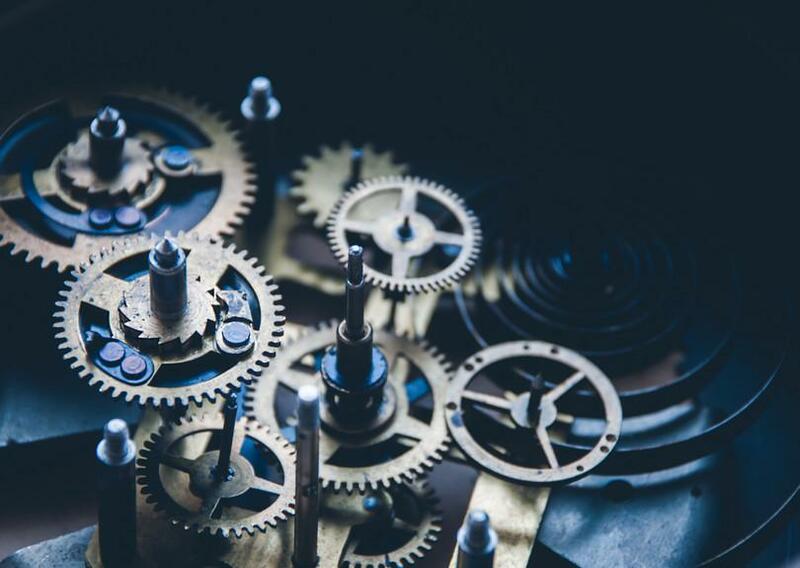 Are the ‘ends’ of economic activity—that is, the things we desire—fixed? Use examples from this unit (study time and grades, or working time and consumption) to illustrate your answer. The subject matter that Robbins refers to—doing the best you can in a given situation—is an essential part of economics. But is economics limited to the study of ‘scarce means which have alternative uses’? In answering this question, include a contrast between Robbins’ definition of economics and the one given in Section 2.11. Note that Robbins wrote this passage at a time when 15% of the British workforce was unemployed. We have analysed what we termed Alexei’s and Angela’s optimal choice of working hours, which sounds like a pretty good thing. But like ‘equilibrium’, ‘social preferences’, and ‘efficient’, all of which sound positive, ‘optimal’ choices by individuals may lead to social problems that public policies should address. An optimal choice for an individual simply means doing the best that he or she can under the circumstances. But as you already know, if this means ignoring the positive or negative external effects that one’s choices impose or convey to others, what is optimal for Alexei or Angela may result in a social dilemma. So far, we have not considered Alexei’s or Angela’s neighbours and friends; they have been acting in isolation. But one of the reasons why a person may choose to work longer hours is to be able to show off their material success to others. Some goods—such as expensive cars, watches, and clothes—may be desired as status symbols. Their owners value these or other luxuries partly because ownership raises their status above that of other people. Perhaps one of your motives when you buy a car, or a coat, is to demonstrate your wealth and superior style. Or perhaps you settle for a cheaper second-hand coat but feel envious, embarrassed, or disadvantaged at a job interview. Thorstein Veblen (1857–1929), an economist and sociologist, described buying luxury items as a public display of social and economic status as conspicuous consumption. The process is more commonly described as ‘keeping up with the Joneses’. Veblen made an important point—when we work, buy, save, and engage in other economic activities, we are not only attempting to get things; we are also trying to be someone consistent with our own aspirations and the respect of others. Expensive goods are a good way to communicate high income for the simple reason that poor people will not be able to compete on this terrain. The rich are the ‘Joneses’, whom people want to emulate. A good—such as high status, conspicuous consumption, or power—which, if enjoyed by one member of a community is experienced negatively by others. The more one person benefits from this good, the more others are harmed. Goods that are valued more because they are a signal of status or income are an example of a larger class called positional goods. They are positional because they are based on status or power, which can be ranked as high or low. Our positions in this ranking, like the rungs of a ladder, may be higher or lower. But there is only a fixed amount of a positional good to go around. If Jo is on a higher rung of the ladder because of her new coat, somebody must now be on a lower rung. Positional goods are sometimes called ‘public bads’. Like public goods, they are ‘available’ to everyone—nobody in the neighbourhood can escape the fact that one of the neighbours is driving a BMW. But instead of a positive external effect on others, the effect is negative. To see how this leads to a social dilemma, consider the case of Sue Smith and her sister Jo Jones, each moving with their families to a new town. Each family has a choice between buying a luxury house or a more modest one. Their payoffs are represented in Figure 4.20. Since both families have limited funds, they would be better off if both bought modest houses than if both bought luxury ones, squeezing the rest of their budgets. But Sue is status-conscious and the two families are competitive when it comes to lifestyle. 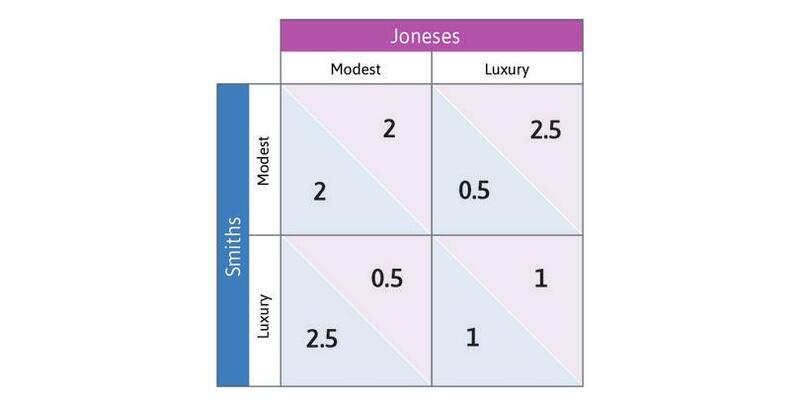 If the Smiths buy a modest house, the Joneses can benefit from feeling superior if they choose a luxury house. The Smiths, in turn, will feel miserable. In short, Sue is trying to keep up with the Joneses, and Jo is trying to keep up with the Smiths. Figure 4.20 Keeping up with the Joneses. You can see that this problem has the structure of a prisoners’ dilemma. Whatever the Joneses do, the Smiths are better off with a luxury house. For both couples, choosing Luxury is a dominant strategy. They will achieve a payoff of 1 each, and the outcome is Pareto inefficient, because both would be better off if they each bought modest houses. The root of this problem is the external effect that one family imposes on the other by choosing a luxury house. The price of the luxury house that Sue’s family will buy does not include the positional externalities inflicted on her sister’s family. If it did, Sue would not buy the luxury house, given the payoffs in the table. A negative external effect that arises from the consumption of a positional good. Examples include the negative external effects imposed on others by the consumption of luxury housing, clothing, or vehicles. What can they do to avoid the Pareto-inefficient outcome? We know from Unit 2 that altruism would help, but Sue and Jo are more moved by sibling rivalry—these families are not altruistic about houses. The ‘keeping up with the Joneses’ problem that Sue and Jo face arises because people care not only about what they have, but also about what they have relative to what other people have. This is sometimes called a Veblen effect. The Nash equilibrium that is the outcome of this social dilemma will be that both families purchase a luxury house, when both would have been better off with more modest accommodation. If the only people trapped in the ‘keeping up with the Joneses’ dilemma were really sisters, we might expect them to contain their sibling rivalry sufficiently to agree that both would buy a modest house. But our story about the sisters is really a parable about entire communities, even on a global level; a face-to-face conversation, eye contact, and a handshake might have worked among sisters, but will not solve the problem. A government policymaker might devise a policy that would address the social dilemma, however. Recall from the previous unit that policies change outcomes by altering the Nash equilibrium of the relevant interaction. So, in this case, the policymaker would have to think of a way to make both families buying a modest home into a Nash equilibrium. The policymaker could do this simply by passing a law prohibiting luxury housing. A more acceptable policy might be to impose a tax on luxury housing. You can see from the payoff matrix in Figure 4.20 that in order to make (Modest, Modest) a Nash equilibrium, a tax of just a little more than 0.5 on luxury housing would accomplish the objective. (This is similar to imposing a tax on placing additional cows on the pasture in the tragedy of the commons game in Section 3.6.) Be sure that you understand what the new payoff matrix (with the tax) would look like, and why it would solve the social dilemma. Veblen effects can be especially important in economies in which ‘the Joneses’ are very rich, so that keeping up with them requires people to work long hours or to shift their expenditure away from necessities—like food consumed privately—and into conspicuous consumption. As a nation gets richer, its citizens often do not become happier: When an individual gets a wage increase or loses a job, there is a large effect on how happy that individual claims to be. But economists have also found that a change in our income has a much smaller effect if most of our acquaint­ances also got the same rise, or also lost their job. When an entire nation gets richer, the effect on individual happiness is small, if there is one at all. Another reason that, as a nation gets richer, its citizens may not become happier is that people may become habituated to their recent standard of living, and so their happiness reverts back to previous levels if they do not keep becoming ever richer. When Veblen effects are present, the conspicuous consumption of the well-off is a positional good, which has a negative external effect. If conspicuous consumption is experienced by everyone, reducing their satisfaction with their own situation, it is a public bad. The relationship between average annual work hours and income share of the very rich (twentieth century). Figure 4.21 The relationship between average annual work hours and income share of the very rich (twentieth century). 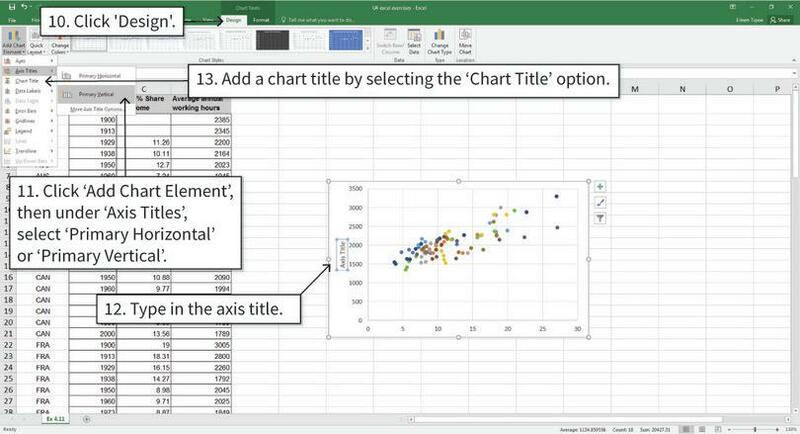 Exercise 4.9 Using Excel: Correlation or causation? Figure 4.21 is a scatterplot of average annual work hours and income share of the top 1%, using data from 10 OECD countries. 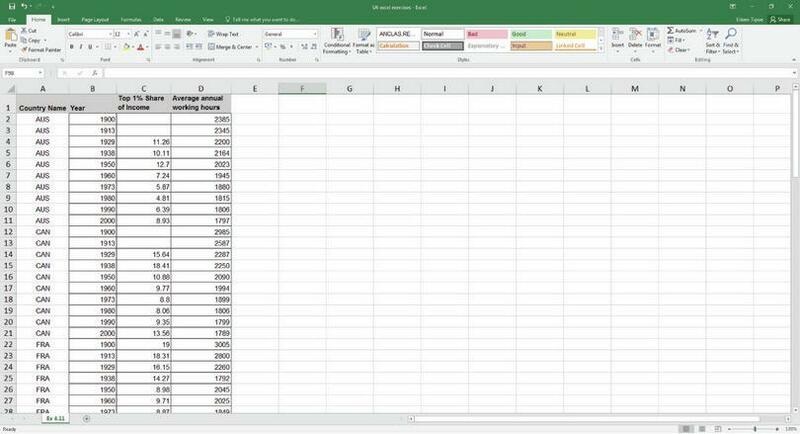 Download and save the spreadsheet containing the data for Figure 4.21. 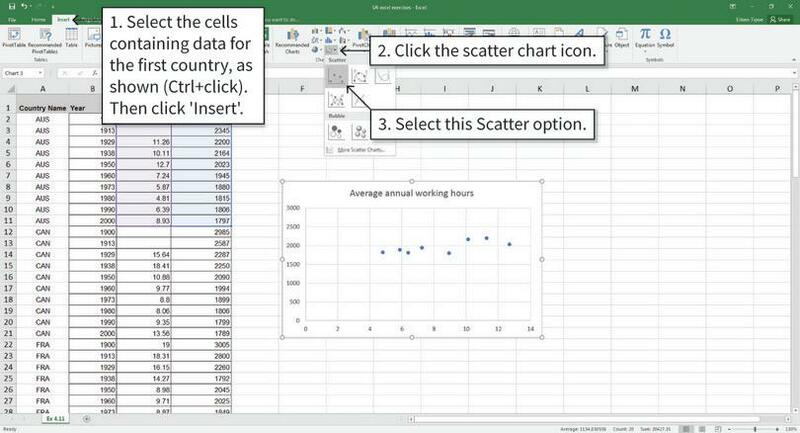 Make a scatterplot similar to Figure 4.21, showing data for each country in a different colour. 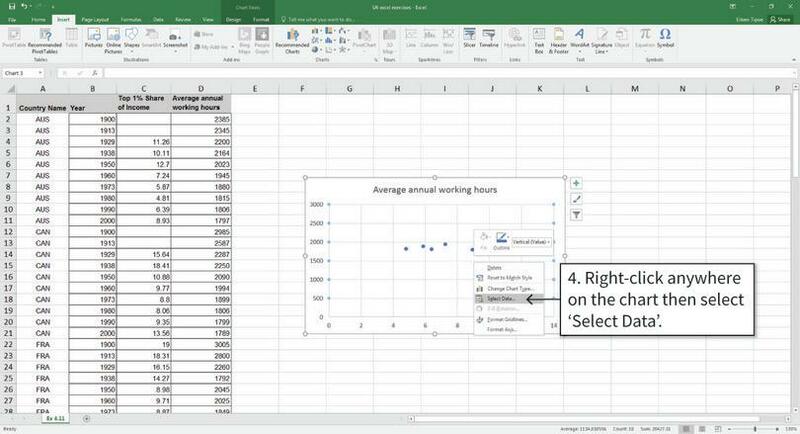 Follow the walk-through in Figure 4.22 below on how to compile a scatterplot diagram in Excel. Are there any patterns you see for particular countries that are different from the overall pattern shown in Figure 4.21? Figure 4.22 Making a colour-coded scatterplot. This is what the data looks like. Column A has country names, Column B has years, Column C has the percentage of total income earned by the top 1% in the population, and Column D has average annual working hours. Figure 4.22a This is what the data looks like. Column A has country names, Column B has years, Column C has the percentage of total income earned by the top 1% in the population, and Column D has average annual working hours. 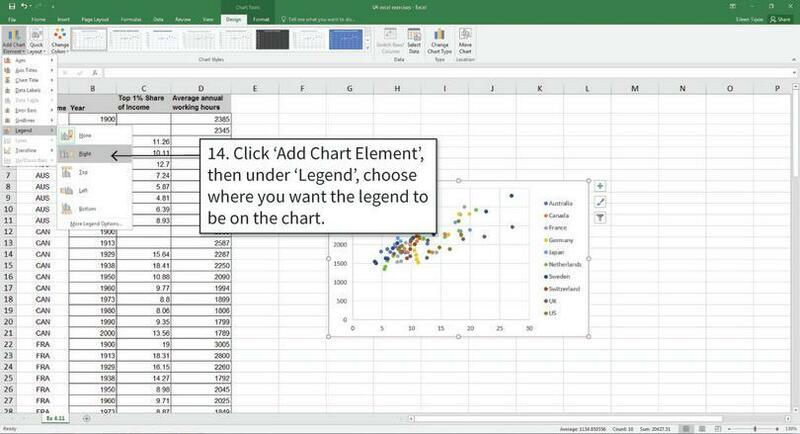 After step 3, you scatter chart will look like the one shown above. Figure 4.22b After step 3, you scatter chart will look like the one shown above. The scatterplot currently has data for Australia only. Now we will add the other countries to the scatterplot one by one, so they will each be shown in a different colour. Figure 4.22c The scatterplot currently has data for Australia only. Now we will add the other countries to the scatterplot one by one, so they will each be shown in a different colour. The section on the left lists all the data series currently plotted on the chart. We need to add the other countries as separate data series, so they will appear in different colours. 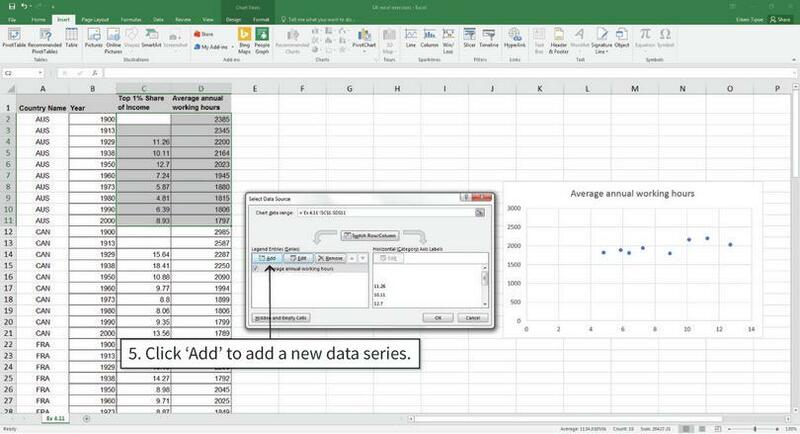 Figure 4.22d The section on the left lists all the data series currently plotted on the chart. We need to add the other countries as separate data series, so they will appear in different colours. 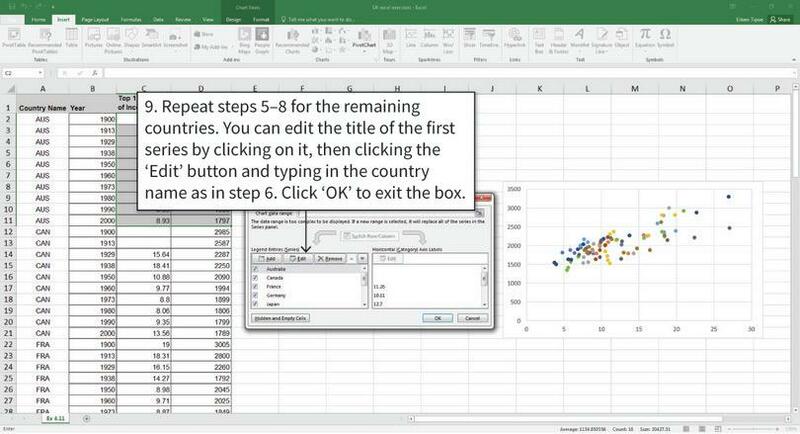 After step 8, the data for the country added will appear on the scatterplot in a different colour. Figure 4.22e After step 8, the data for the country added will appear on the scatterplot in a different colour. After completing step 9, your scatterplot will look like the one shown above, with each country represented by a different colour. Figure 4.22f After completing step 9, your scatterplot will look like the one shown above, with each country represented by a different colour. After step 13, your chart will look similar to Figure 4.21. Figure 4.22g After step 13, your chart will look similar to Figure 4.21. We will add a legend so it is easy to see which colour represents each country. You can see that the relationship between average annual working hours (vertical axis) and income share owned by the top 1% is positive for all countries, but clearer for some countries compared to others. Figure 4.22h We will add a legend so it is easy to see which colour represents each country. You can see that the relationship between average annual working hours (vertical axis) and income share owned by the top 1% is positive for all countries, but clearer for some countries compared to others. Calculate the correlation coefficient between average annual work hours and income share of the top 1%, using data from all countries. What does this coefficient tell us about the strength of the association between these two variables? 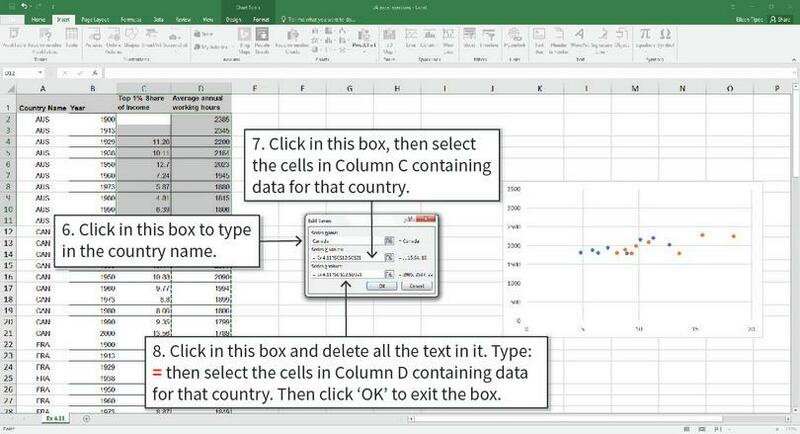 Now calculate the correlation coefficient for each country separately. Which country has the highest correlation coefficient, and which country has the lowest? Suggest some explanations for why the relationship between income share and work hours differs in strength between countries. In this unit, we presented one explanation for what we observe in Figure 4.21, namely that the conspicuous consumption of the top 1% may motivate people to work more (‘keep up with the Joneses’). Can you think of an explanation for why higher average annual working hours would lead to a higher income share of the top 1%? What other factors could be responsible for the observed relationship? Based on your answers, discuss whether we can conclude from Figure 4.21 that a higher income share of the top 1% causes higher average annual work hours. When interpreting changes in working hours, we should also consider the possibility that preferences change over time. If you look carefully at Figure 4.1, you can see that, in the last part of the twentieth century, hours of work rose in the US, even though wages hardly increased. Hours of work also rose in Sweden during this period. Why? Perhaps Swedes and Americans came to value consumption more over these years. In other words, their preferences changed (in diagrammatic terms, this would be a flattening of the indifference curves.) This may have occurred because, in both the US and Sweden, the share of income gained by the very rich increased considerably and the lavish consumption habits of the rich set a higher standard for everyone else. According to this explanation, Swedes and Americans were ‘keeping up with the Joneses’ and the Joneses got richer, leading everyone else to change their preferences. The combined political, cultural and economic influences on our choices may produce some surprising trends. In our ‘Economist in action’ video, Juliet Schor, a sociologist and economist who has written about the paradox that many of the world’s wealthiest people are working more despite gains in technology, asks what this means for our quality of life, and for environment sustainability. Juliet Schor: Why do we work so hard? The example of Veblen effects above concerns houses. Can you think of any other examples where Veblen effects are present? Why do Veblen effects cause inefficiency? Describe in what way Veblen effects are similar to (or different from) pollution? Discuss whether the government should adopt policies to address this market failure and, if so, what might they be? 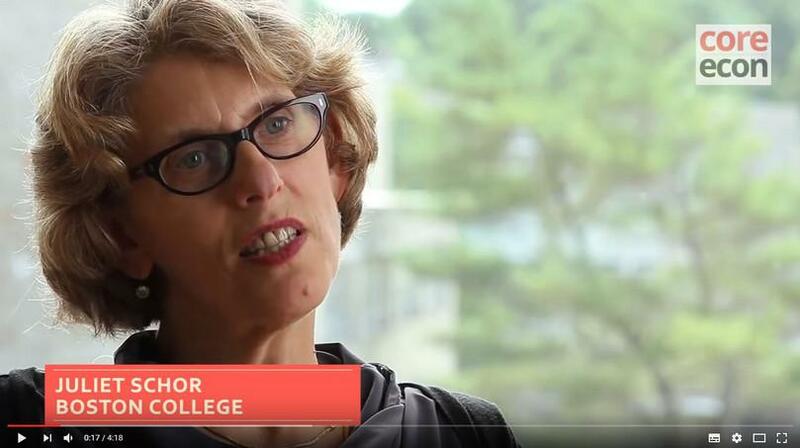 Watch the ‘Economist in action’ video of Juliet Schor. Which of the following statements were not mentioned in the video? Technological advancement does not necessarily mean shorter working days. Workers can choose jobs but not their working hours. There has been a definite divergence recently in working hours across countries. Countries with longer working hours tend to have higher carbon footprints. This was mentioned in the video. Trends in working hours since the 1970s depend on the data used. Technological improvements have enabled people to increase their consumption of goods and services and also to enjoy more free time. The extent to which higher wages have led to decreased working hours varies across time and between countries, reflecting the fact that preferences may change over time and that they are shaped by different cultural factors. Mindful of three key concepts in economic modelling (ceteris paribus, incentives, and relative prices), we have built a constrained choice model to study an individual’s choice between different combinations of consumption and free time. The production function translates inputs (like hours of work) into outputs (like grades or grain.) Diminishing marginal product means that, for each additional unit of input, the resulting increase in output becomes smaller. For some given level of input, the marginal product is the slope of the production function, while the average product is the slope of the ray from the origin to a given point on the production function. The feasible frontier gives the maximum amount of one good (grain) that can be obtained for a given amount of another (free time). Its slope, the marginal rate of transformation (MRT), represents the opportunity cost of, for example, increasing free time by one hour in terms of the grain the individual must forgo. Indifference curves join together all combinations of goods (like free time and consumption) that provide the same level of utility. Indifference curves are based on our preferences, that is on the benefit or cost that we associate with each possible outcome. To reflect the trade-off between two things that we value positively ('goods'), indifference curves slope downwards. The slope of an indifference curve is called the marginal rate of substitution (MRS), and it represents the trade-off between the two goods, namely, how much more of one good would be required to offset the subtraction of one unit of the other good. Technological progress can be modelled as an upward shift of the production function. This expands the feasible set (in this case just the mirror image of the production function). The substitution effect: The amount by which leisure hours fall due to their higher opportunity cost in terms of foregone income. The income effect: The amount by which free time increases as a result of higher income, assuming that, like income, free time is a normal good. Finally, we have considered how the conspicuous consumption of positional goods as a status symbol may lead to a Pareto-inefficient outcome in which one person’s luxury consumption inflicts negative external effects, called Veblen effects, on others. In Unit 1 and in this unit, we have used GDP per capita to compare living standards across countries or measure progress in living standards over time. The rationale is that higher income/expenditure means a greater ability to spend on goods and services, which in turn increases material wellbeing. Since material wellbeing can contribute to non-material wellbeing, we might also expect countries with higher GDP per capita to have higher non-material wellbeing. But how do we measure non-material wellbeing? And does a higher GDP per capita necessarily mean a higher non-material wellbeing? In the Doing Economics Empirical Project 4 we answer these questions. The project shows how different variables can be summarized into an index by looking at GDP and its components. We will then learn how indices of non-material wellbeing are constructed, and compare an index of material wellbeing (GDP per capita) with an index of non-material wellbeing (the Human Development Index). Go to Doing Economics Empirical Project 4 to work on this problem. explain the difference between two measures of wellbeing (GDP per capita and the Human Development Index). Easterlin, Richard. 1974. ‘Does economic growth improve the human lot?’ In M Abramovitz, P David & M Reder (Eds. ), Nations and Households in Economic Growth: Essays in Honor of Moses Abramovitz. New York: Academic Press. Fogel, Robert William. 2000. The Fourth Great Awakening and the Future of Egalitarianism: The Political Realignment of the 1990s and the Fate of Egalitarianism. Chicago: University of Chicago Press. Friedman, Milton. 1953. Essays in Positive Economics. (7th ed.) Chicago: University of Chicago Press. Harford, Tim. 2015. ‘The rewards for working hard are too big for Keynes’s vision’. The Undercover Economist. Keynes, John Maynard. 1963. ‘Economic Possibilities for our Grandchildren’. In Essays in Persuasion. New York, NY: W. W. Norton & Co.
Plant, E. Ashby, Karl Anders Ericsson, Len Hill, and Kia Asberg. 2005. ‘Why study time does not predict grade point average across college students: Implications of deliberate practice for academic performance’. Contemporary Educational Psychology 30 (1): pp. 96–116. Robbins, Lionel. 1984. An Essay on the Nature and Significance of Economic Science. (3rd ed.) New York: New York University Press. Stevenson, Betsey, and Justin Wolfers. 2008. ‘Economic growth and subjective well-being: Reassessing the Easterlin paradox’. Brookings Papers on Economic Activity, pp. 1–87. Whaples, Robert. 2001. ‘Hours of work in U.S. History’. EH.net Encyclopedia.